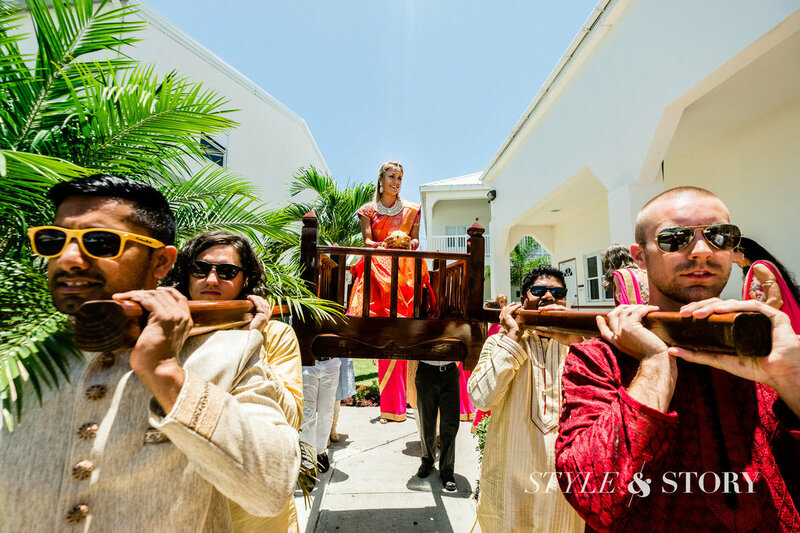 On the actual day of the wedding is the baraat—a procession from the groom's side to go pick up the bride. 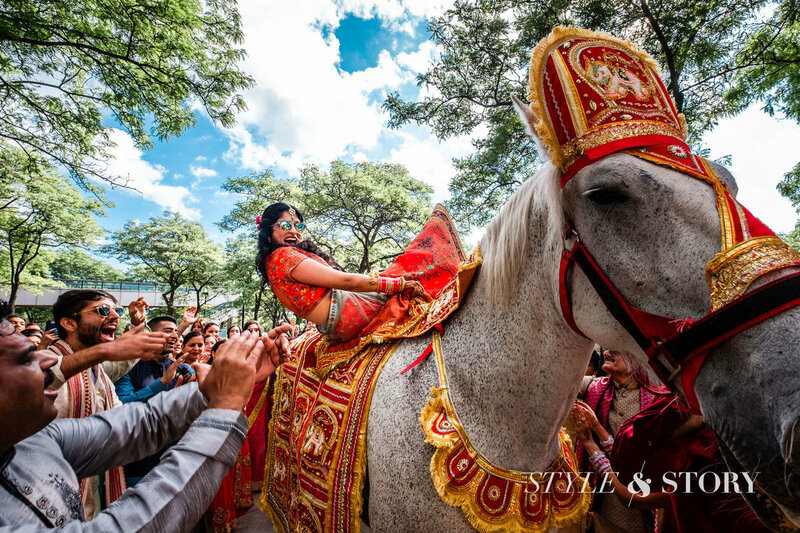 Traditionally, the groom sits on a horse and is surrounded by people singing and dancing. A band marches along with the baraat. Finally, the ceremony takes place. 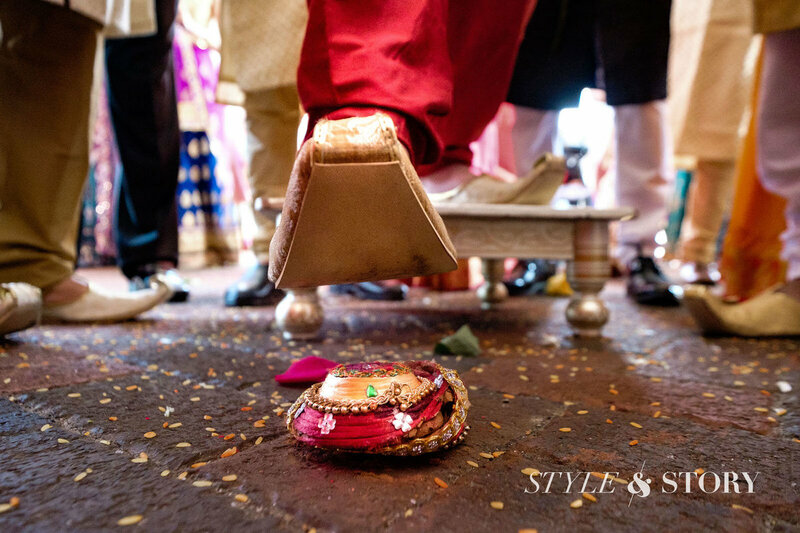 Depending on where you're from in India, this can involve seven rounds of the ceremonial fire or saat phere which take place after tying a knot between the married couple's garments. There may also be an exchange of flower garlands. 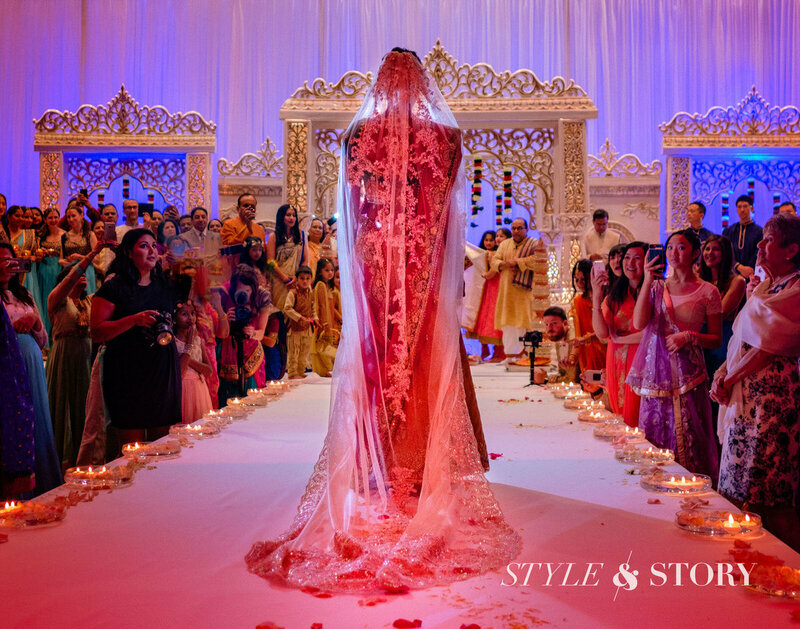 Sometimes, a curtain is set up to ritually separate the bride and groom before marriage and this curtain is ceremonially lowered. 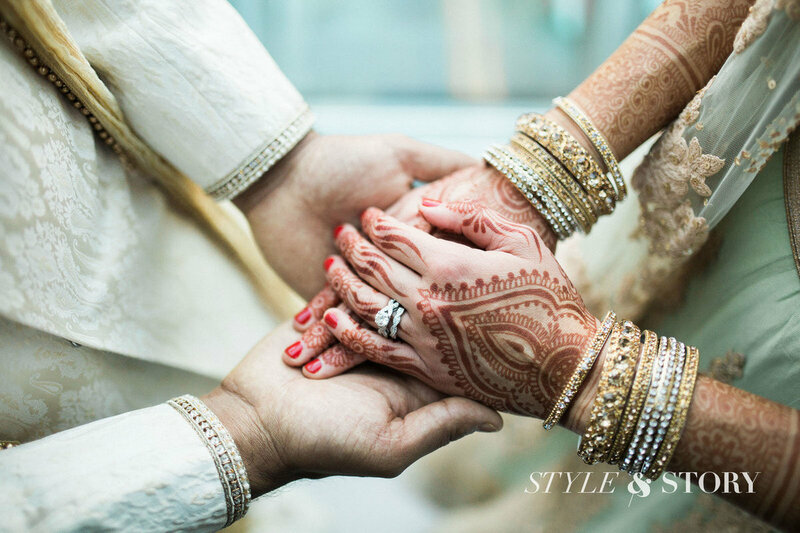 Since India is a country with a rich and varied heritage and several different religions, the types of wedding ceremonies are endless. 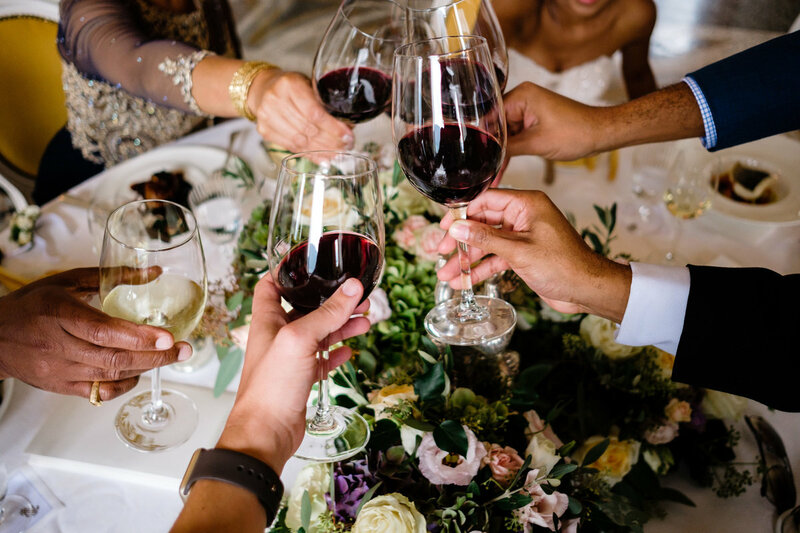 Eventually, the wedding reception takes place which consists of dinner, singing, dancing and congratulating the married couple. 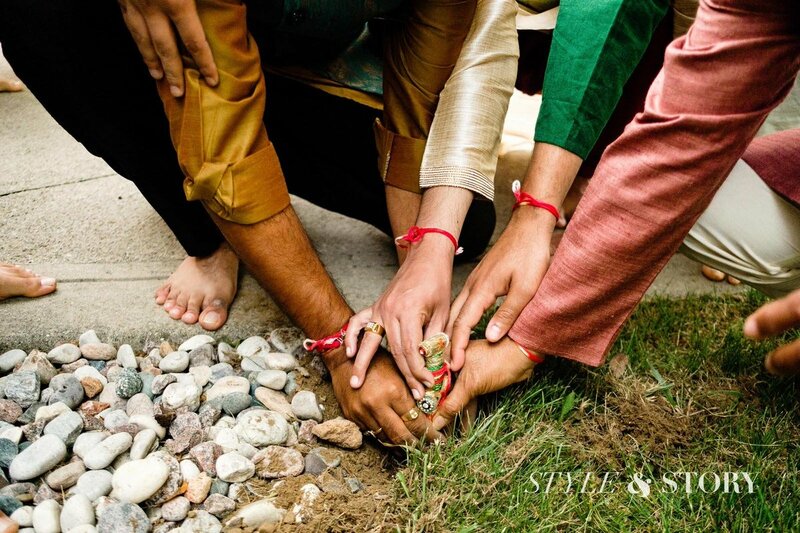 Given the intricacy and colorful nature of these events, there's a lot of opportunity for striking wedding photography which can focus on capturing rituals as well as emotions, not to mention the amazing wedding outfits. 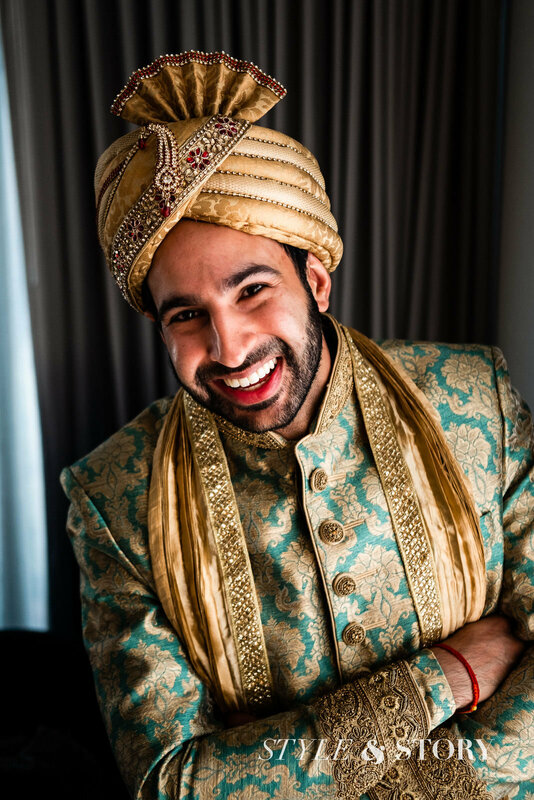 We understand that planning your Indian Wedding can feel very overwhelming. 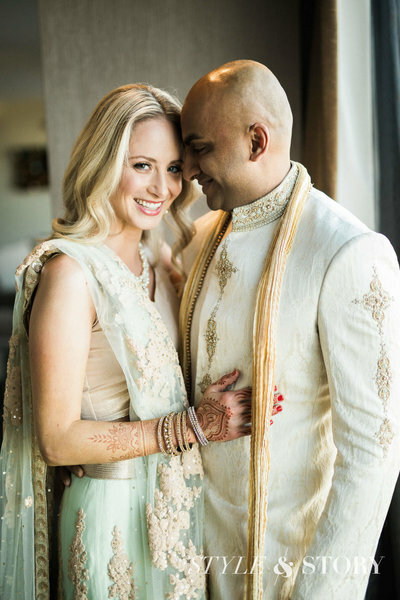 We highly recommend connecting with Priscah at Joie de Vivre Events to help you plan the occasion! 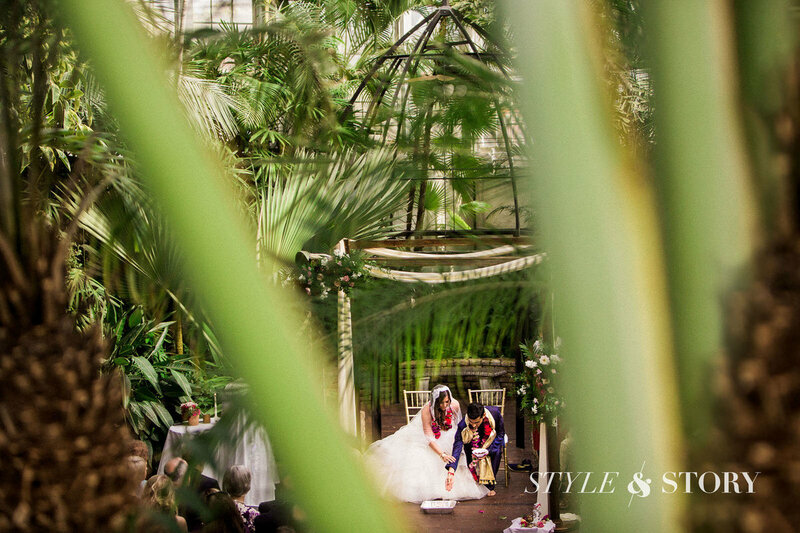 As much as we value capturing every little detail, Priscah makes sure that every little detail is executed to perfection! 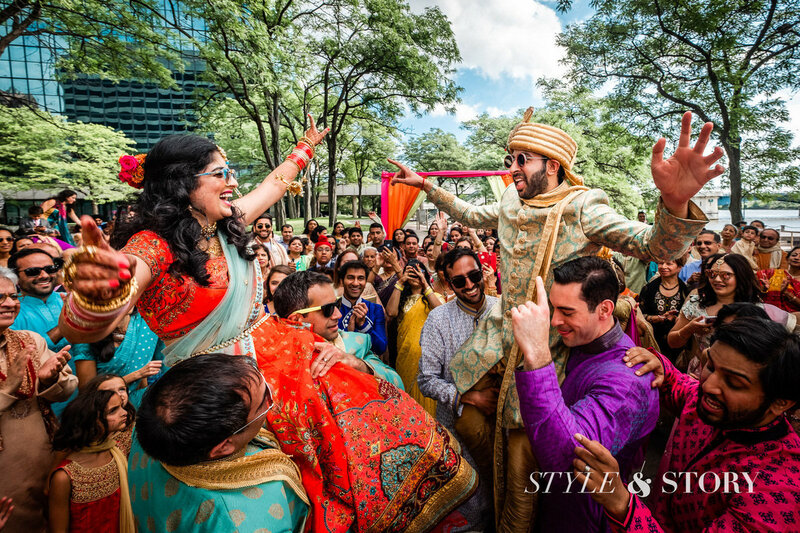 Indian weddings are big, bright, colorful and full of sound—a feast for the senses. 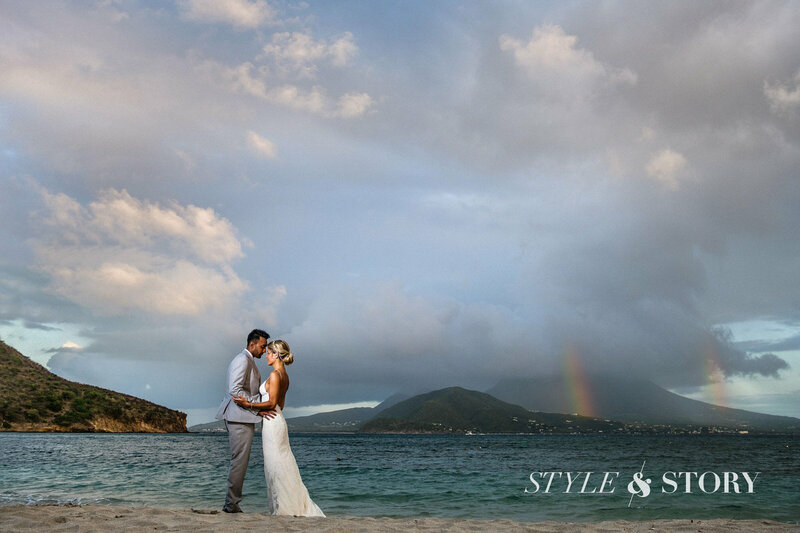 These are our absolute favorite weddings to document! 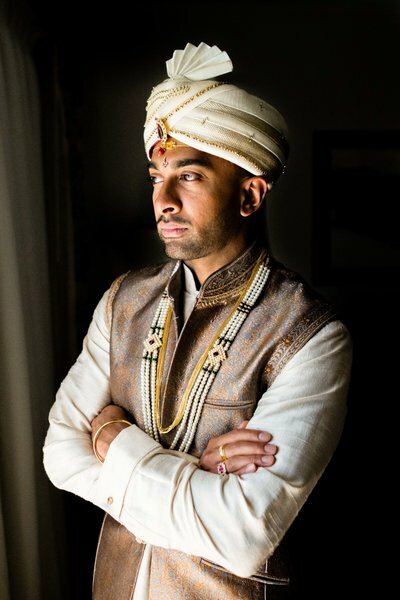 We have gone ahead and provided a bunch of information covering the nuances to an Indian wedding - we hope his context helps as you plan yours! 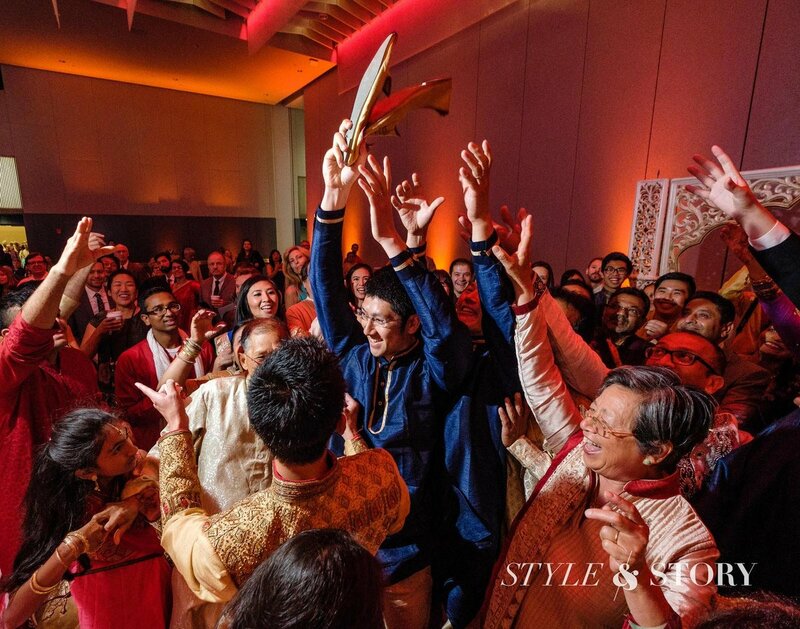 Indian weddings typically go on for several days and include several events such as the sangeet, the mehndi, the baraat, the ceremony itself and the reception. In olden times, these events used to be spread out over several months but nowadays, due to time constraints, they're back to back. Here is the brief overview of events with more detailed information below. 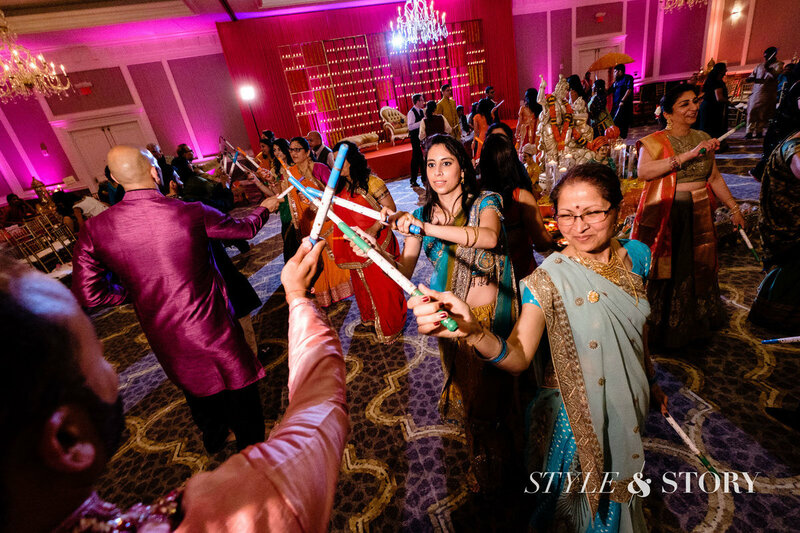 The word sangeet means music. 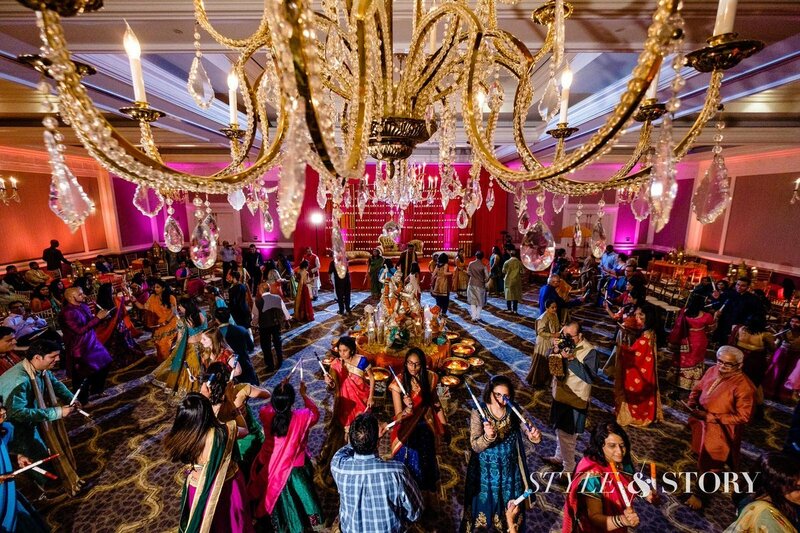 And as the name suggests, the sangeet is a musical event. 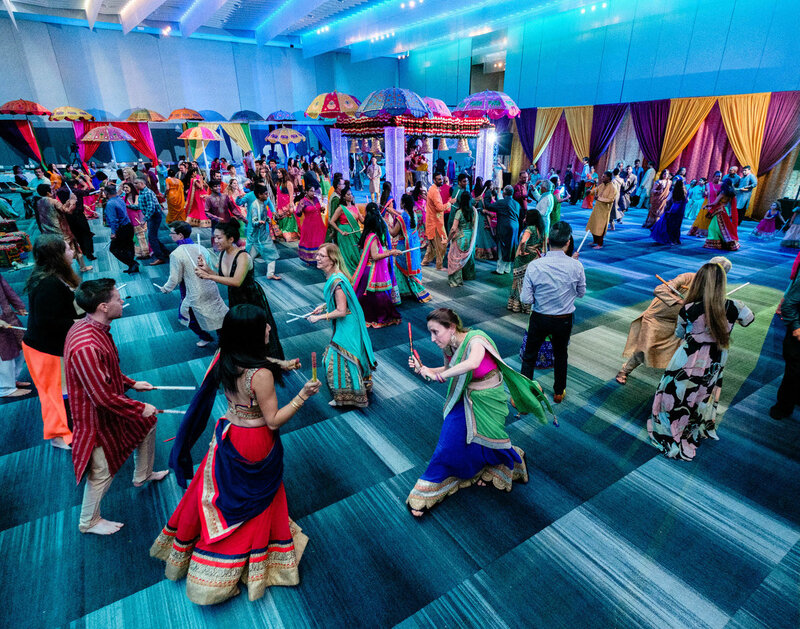 Previously, this just used to be a simple event, with people singing extemporaneously to the accompaniment of a "harmonium" or a small keyboard. 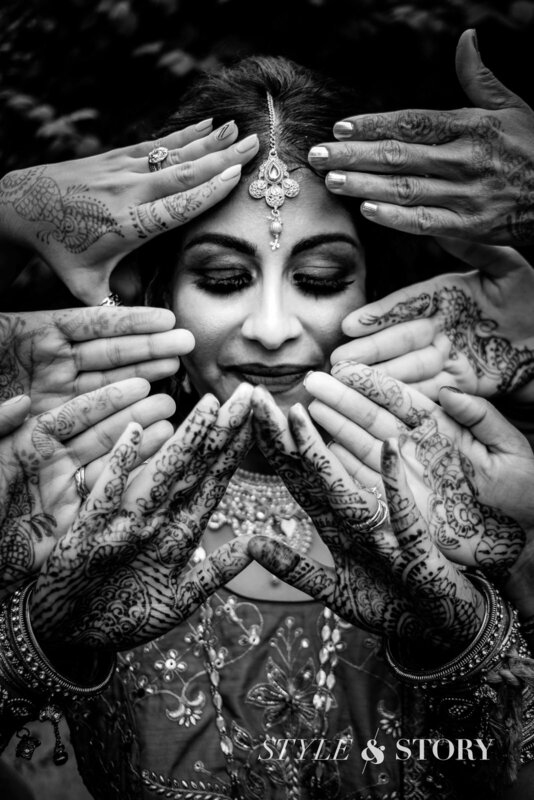 But nowadays, the sangeet is very elaborate, with groups of people singing and dancing to Bollywood songs which they've choreographed to a T.
The word mehndi refers to intricate henna tattoos done on the hands and feet. 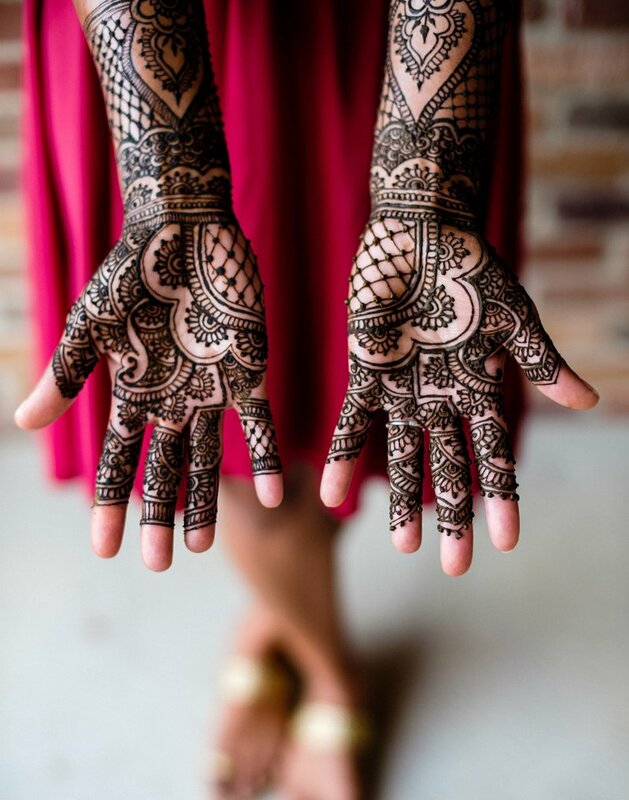 These henna tattoos are works of art which include patterns of flowers, leaves, keris (young mangoes), curlicues and even birds and animals. 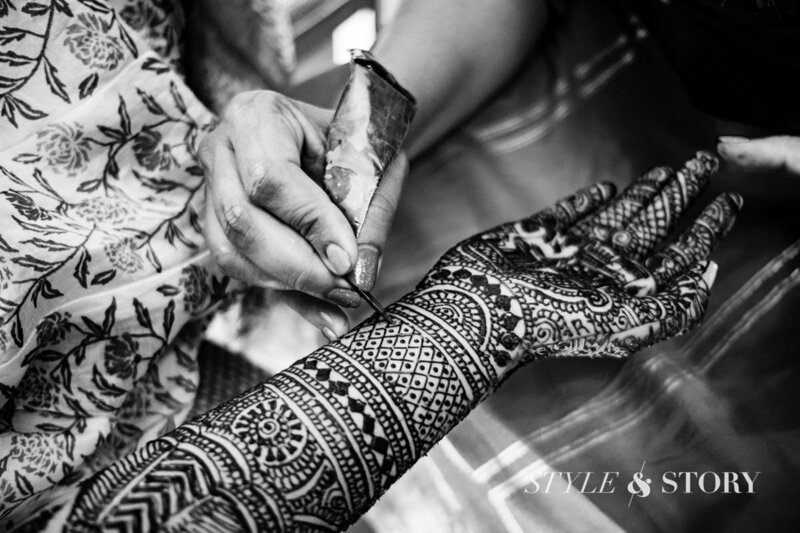 During the mehndi event, the bride and all the other women in the wedding party get henna tattoos done on their hands and, if they want, their feet. Not only is Indian clothing extremely colorful, with a lot of primary colors but it's also chock full of silver and gold. 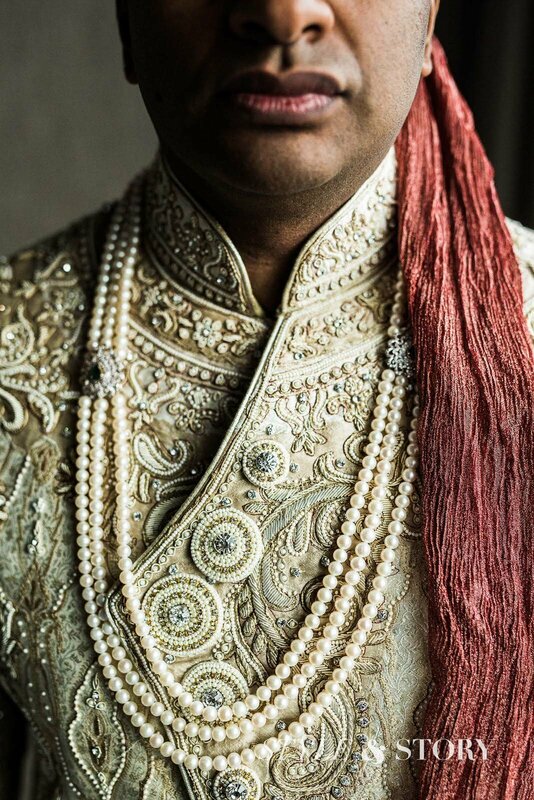 Often, silver and gold threads are woven into the fabric of the clothes themselves, creating a brocade effect. Of course, you'll see a lot more of this type of weaving in women's clothing but it's also present in men's clothing, to a lesser degree. 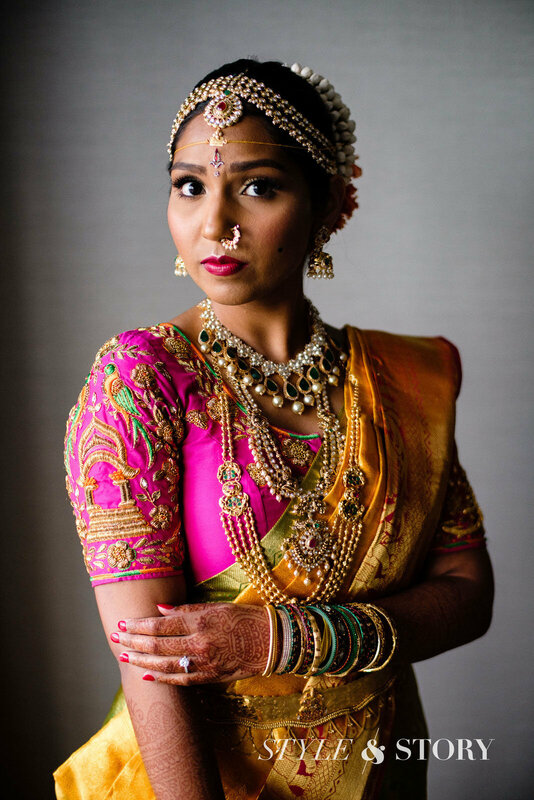 Women usually wear saris in which the entire six yards of gorgeous, heavy material is artistically draped around the body, enhancing a woman's curves. 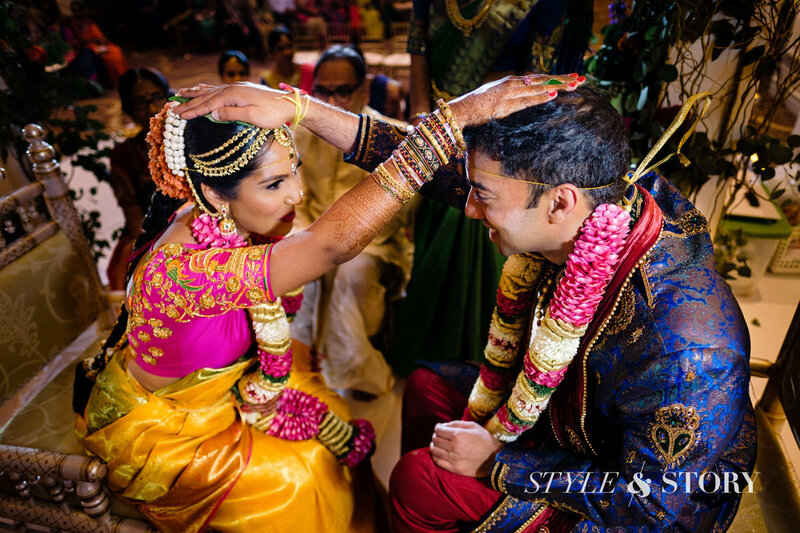 But since saris are considered more traditional, most brides only wear them for the actual ceremony, opting for a lehenga at other times. 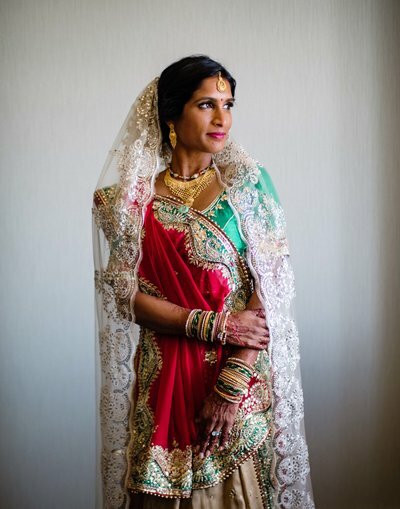 A lehenga consists of a fitted blouse, a flared skirt and a scarf draped over the head and tucked into skirt. 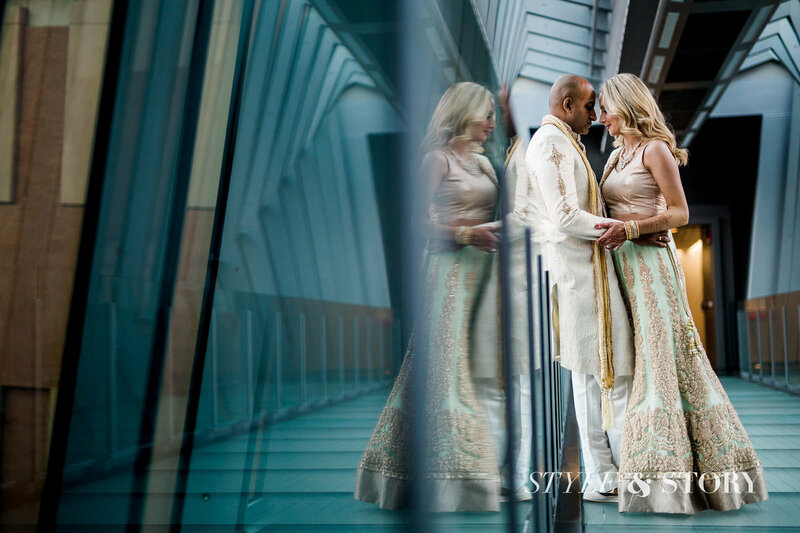 Nowadays, many brides are going with backless, halter and strappy styles to give their traditional outfits a little bit of edge. There's also a lot of gold jewelry. 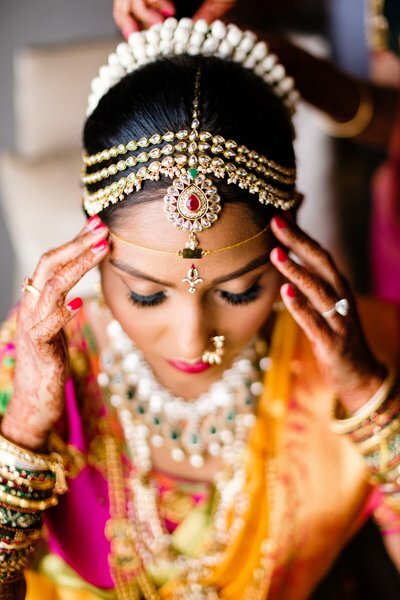 It's not unusual for an Indian bride to wear 2-3 necklaces, large earrings, a nose ring, a mang tikka (a chain which follows the part of the hair to end in an ornament at the top of the forehead), anklets and numerous bangles on each arm. 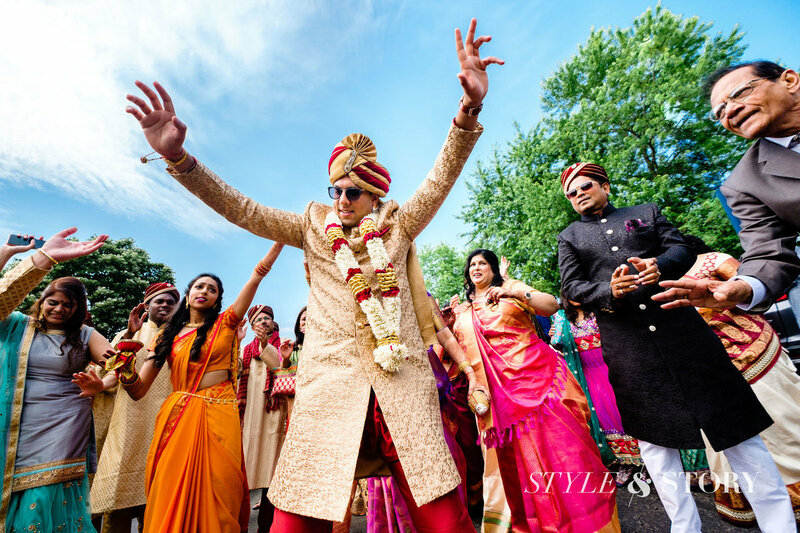 Men wear kurtas—knee-length tunics—for the smaller events and sherwanis—long, fitted coats—for the baraat, ceremony and reception. 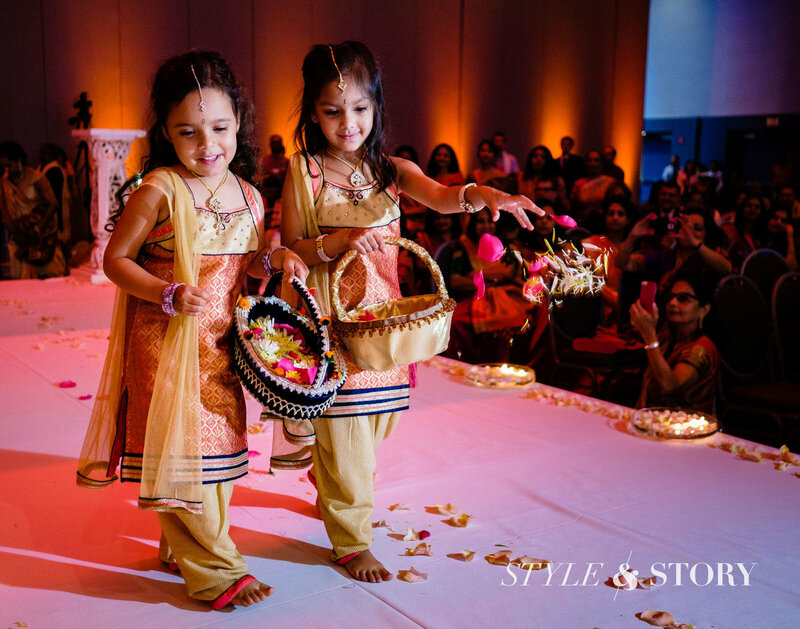 These are paired with loose pants called pyjamas or fitted pants called churidars. 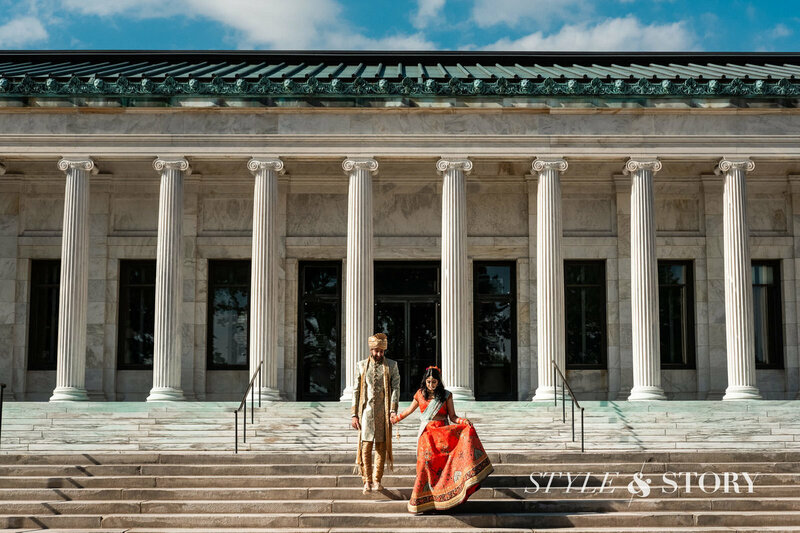 It's up to the wedding photographer to capture the variety of clothes worn at all the events, since this is the one time in their life that the wedding couple gets to be completely extravagant in the way they dress. 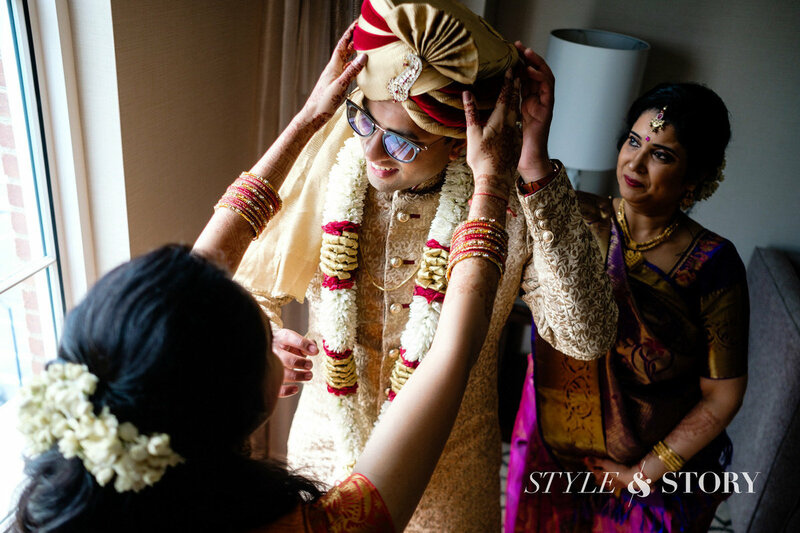 The photographer will focus on both—full-length photos which capture the overall beauty of the wedding outfits and close ups which focus on the little details. At the same time, they'll make an effort to bring out the subject's natural beauty, rather than focusing only on the outfits. 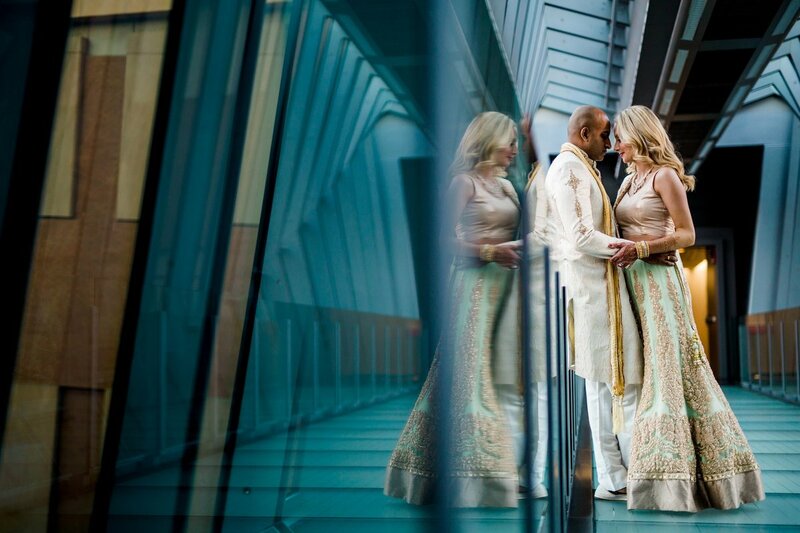 It's not enough to just capture the wedding outfits; you also need photographs which capture the personalities of and the interaction between the bride and groom. This can be done in portraits. 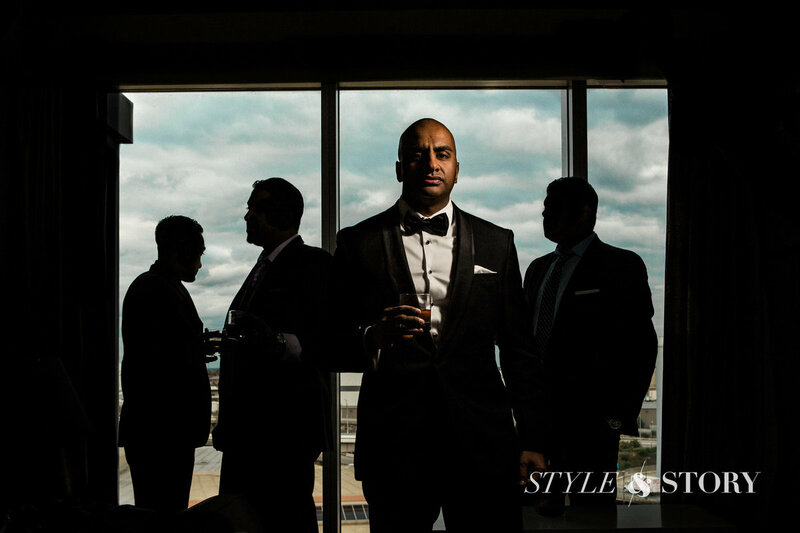 Given that you have some time to prepare for these portraits and also discuss them with the photographer, it's possible to come up with some dramatic, artistic, "wow" shots as well as candid, natural, authentic moments. 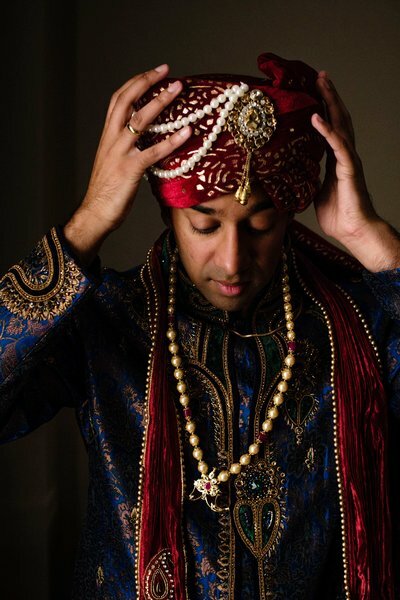 Portraits can be taken at various venues of your choosing. A lot of people like natural beauty venues such as parks or beaches. Or they like to make portraits meaningful by going back to the place where they met or places they usually like to go to. 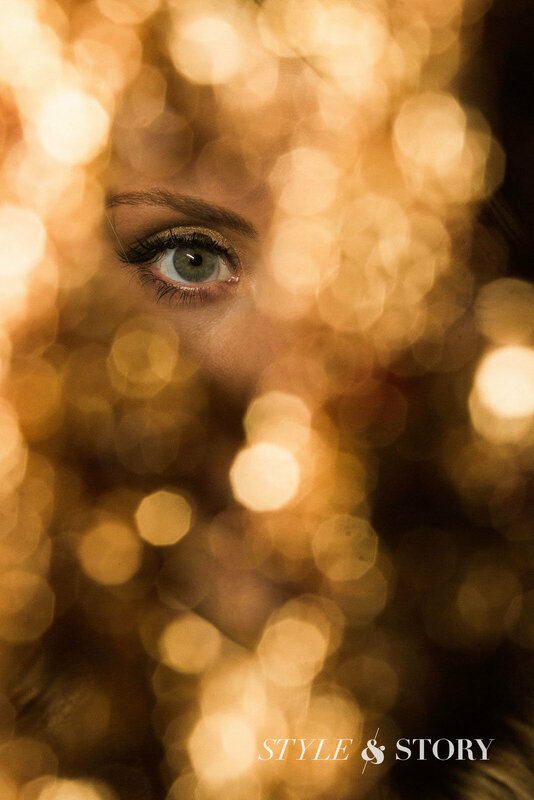 But you can also get more creative by taking portraits in unexpected places. 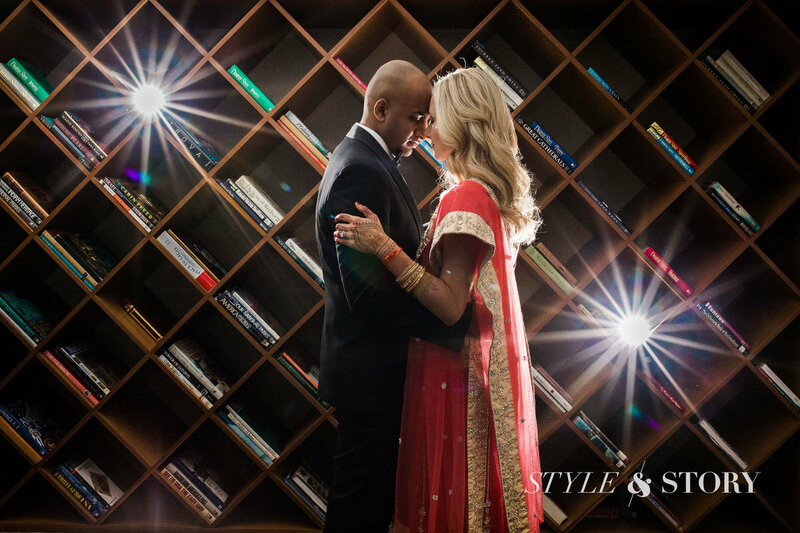 For example, why not contrast the extravagant bridal outfits with the interior of an office or a library? 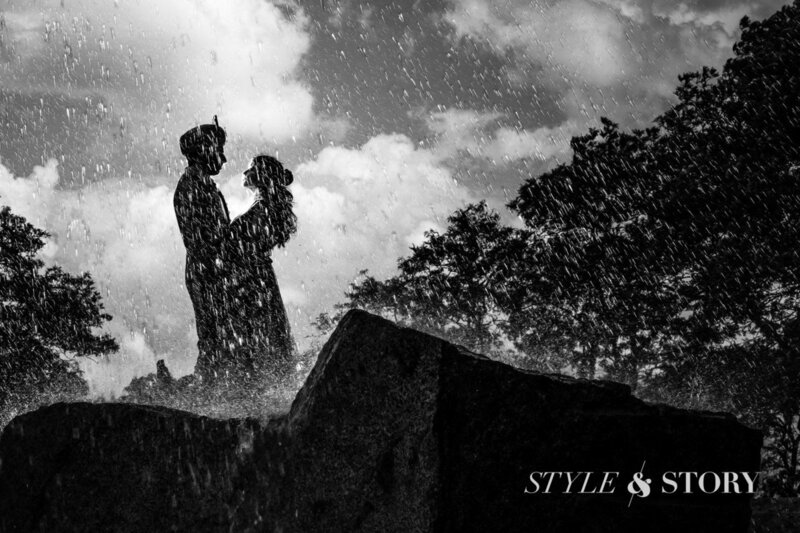 You could even do portraits with the limestone formations of a canyon as a backdrop. 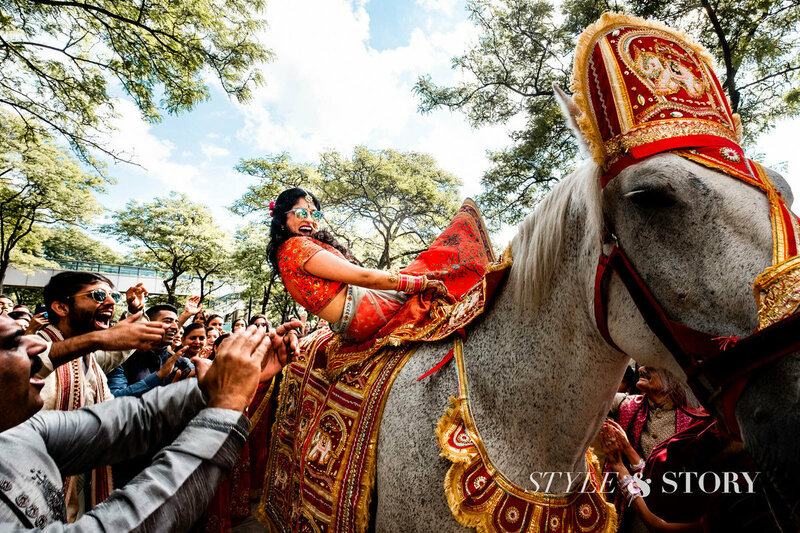 Or place the bride with her bridal paraphernalia in the middle of a crowded city street. 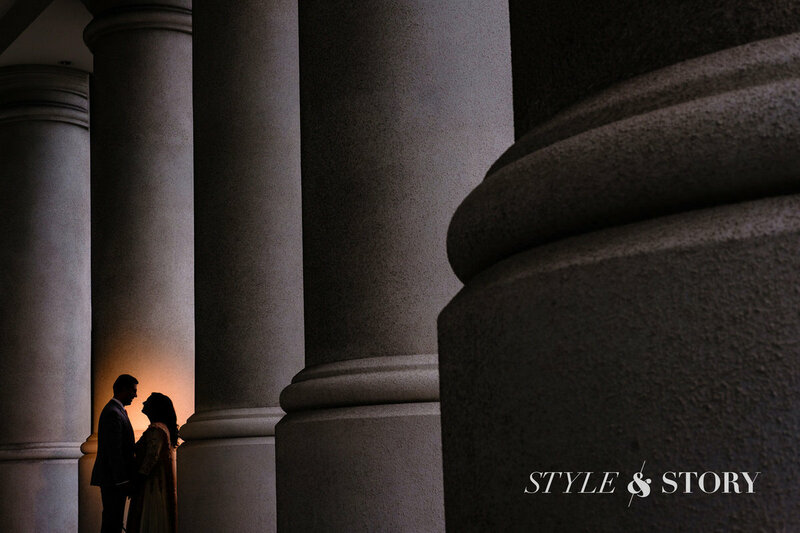 There are many places where you can take bridal portraits, thus adding to their "wow" factor. 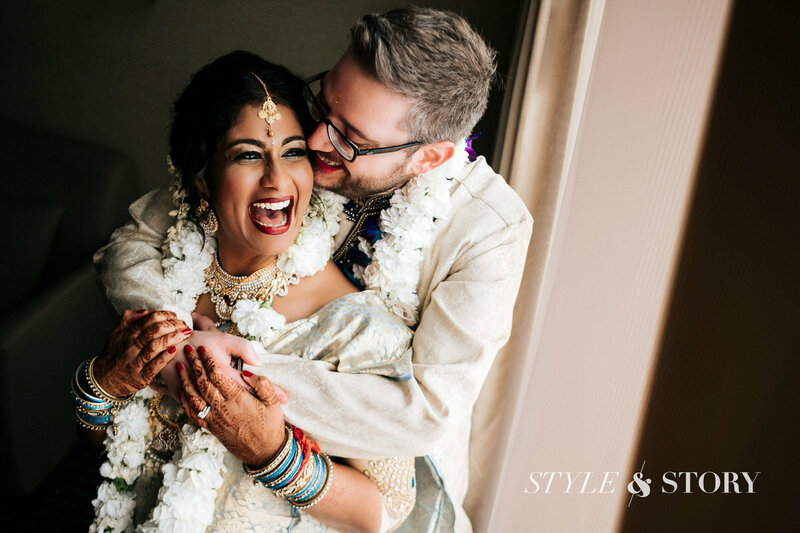 At the same time, there's something to be said for a photo which just captures the natural expressions of the bride and groom or zooms in on a private moment between the two. 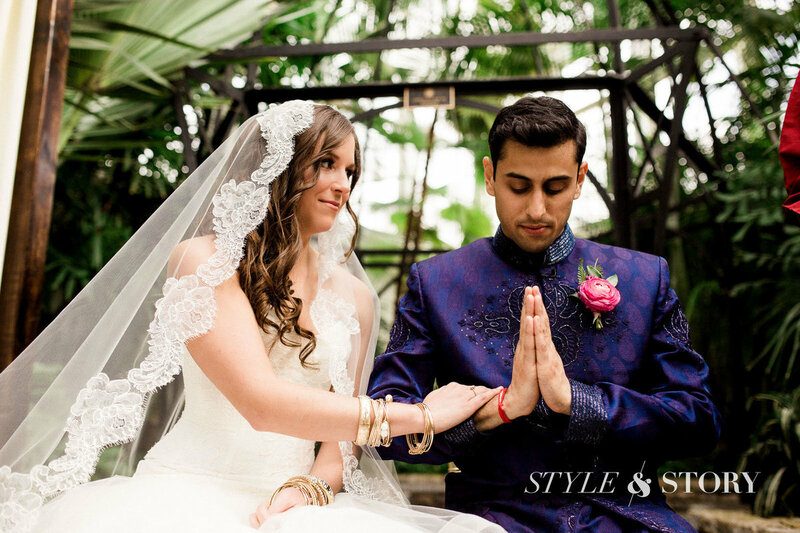 Don't be afraid to act naturally and get comfortable around your wedding photographer in order to make this happen. 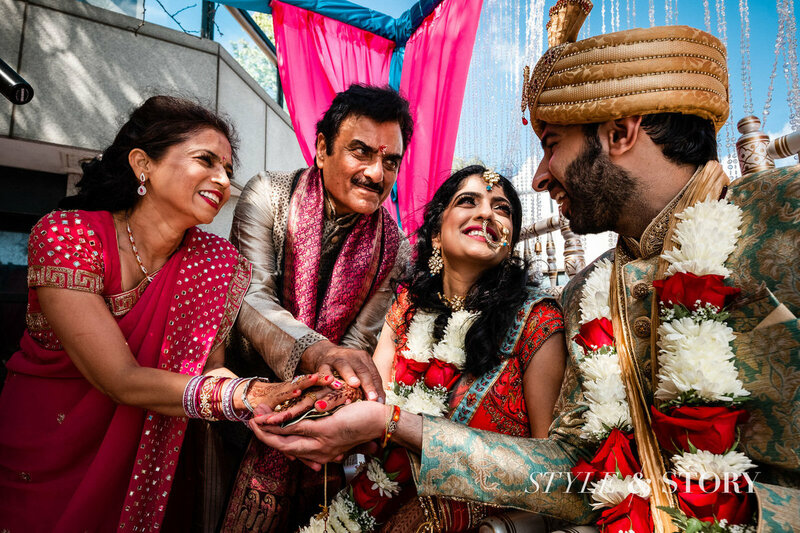 Sangeet photos are likely to be the most colorful and striking of all the photos taken in an Indian wedding. 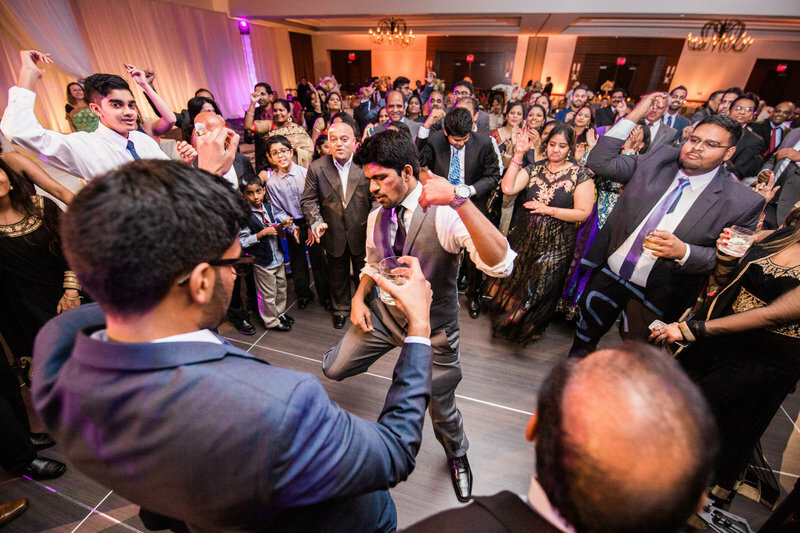 If you've ever seen a Bollywood song, with the main dancer in the center and a troupe of supporting dancers all around, that's pretty much what you can expect to see in the sangeet. 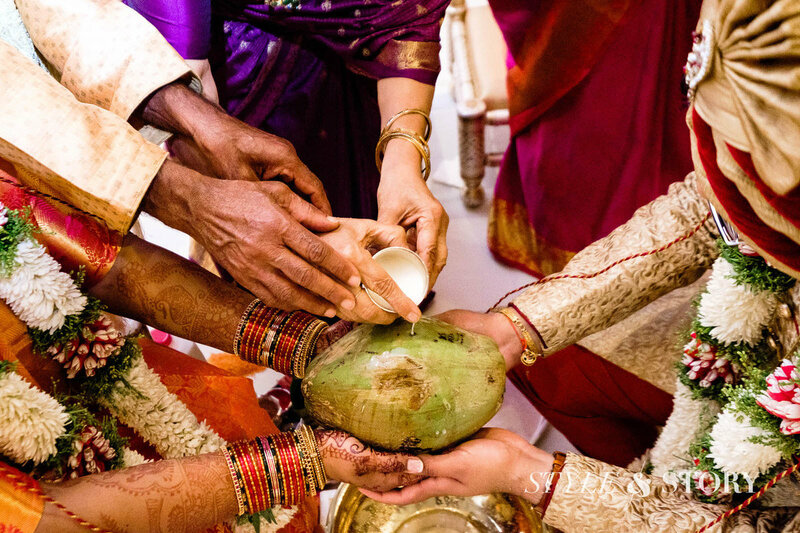 Often, it takes the form of a competition between the bride's side and the groom's side. 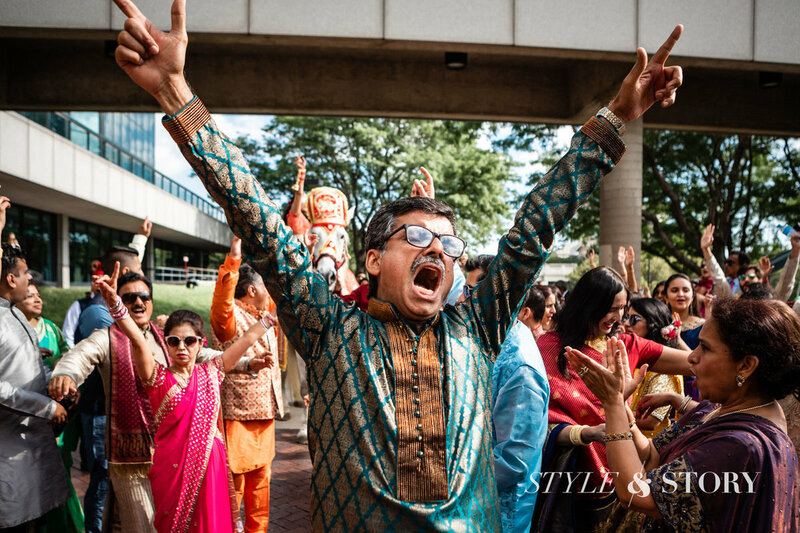 Given that everyone is trying to outdo one another, you'll see spectacular dancing, stunning outfits and a lot of enthusiasm all around. This gives a photographer a lot of scope to take great photos. 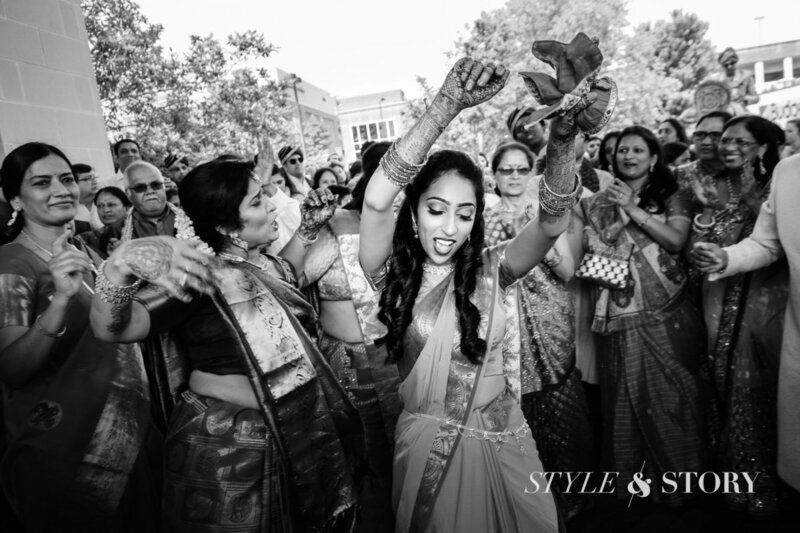 These can include motion photos which, if taken well, can give a sense of rhythm and enthusiasm. 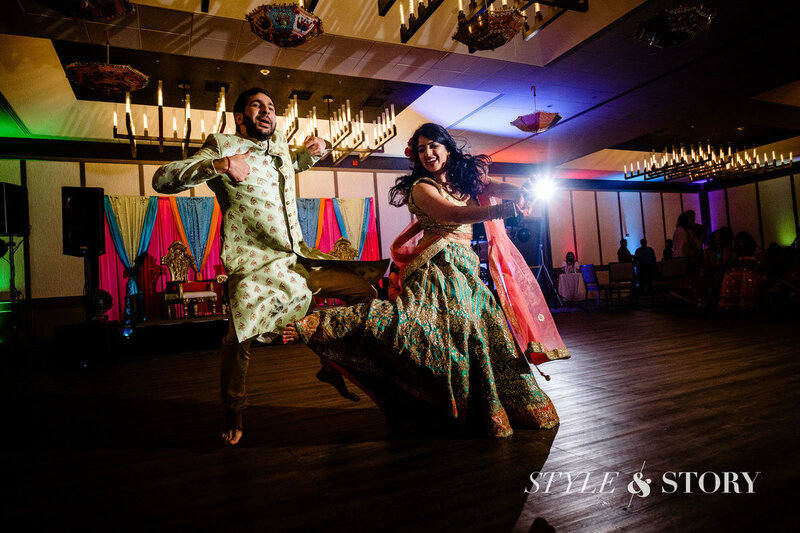 Many Bollywood dances contain steps from folk dances like bhangra; so you can also get a sense of tradition from these photos. Plus, these dances do a great job of showing off the dancers' outfits, especially when they are spinning; this can make for a great photo. 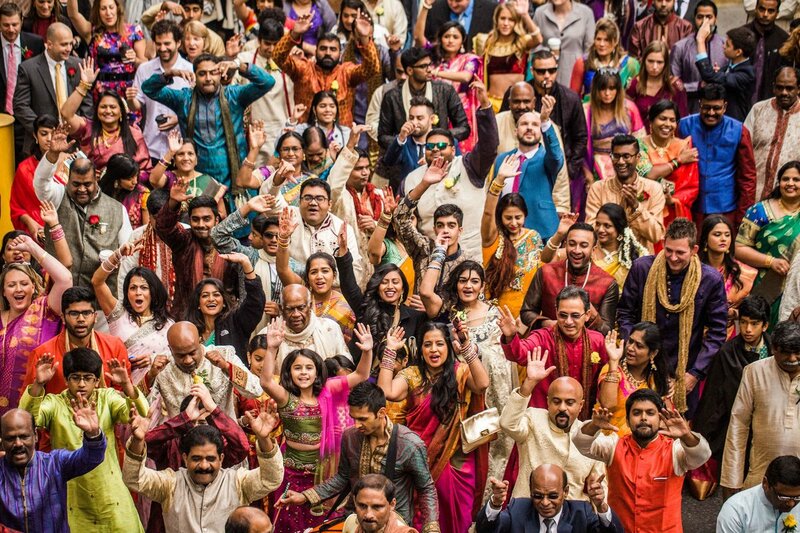 In addition to motion photos, it's also possible to get close ups of the dancers before or after the dances or even capture the whole troupe together in a group photo. 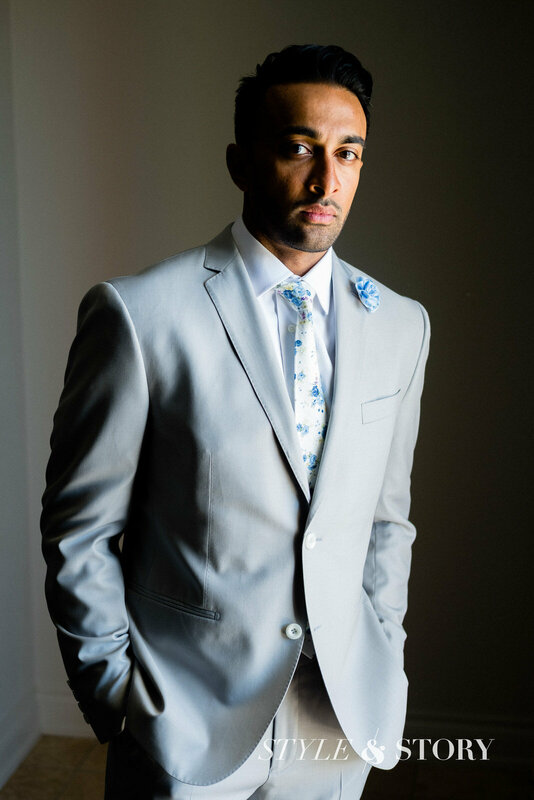 This gives the photographer a chance to get portraits of other people attending the wedding, not just the bride and groom. 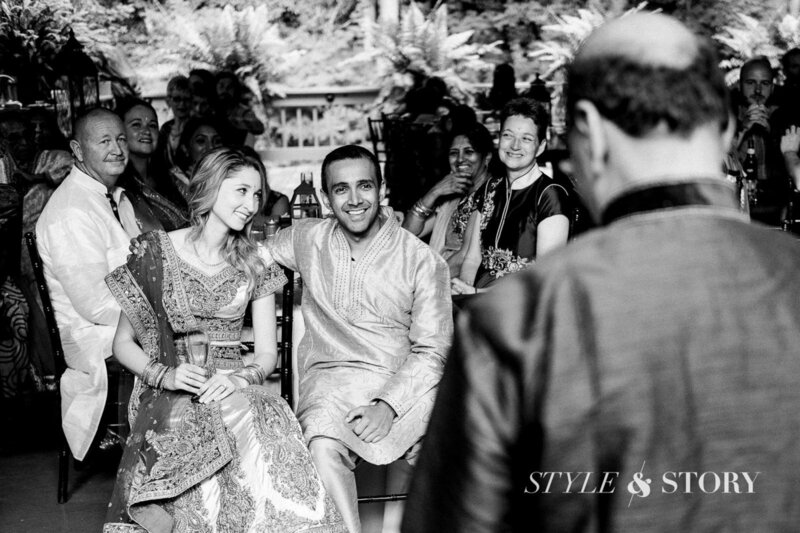 It also makes for great memories in the future, when the married couple looks back at everyone who performed at their wedding. 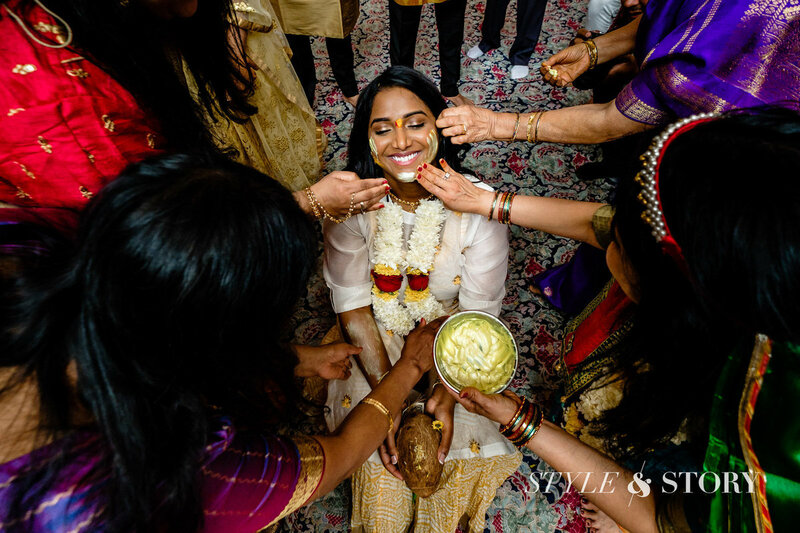 As opposed to the fast-paced sangeet, the mehndi is a more laidback event where everyone is just sitting around, chatting, getting henna tattoos and teasing the bride about married life. 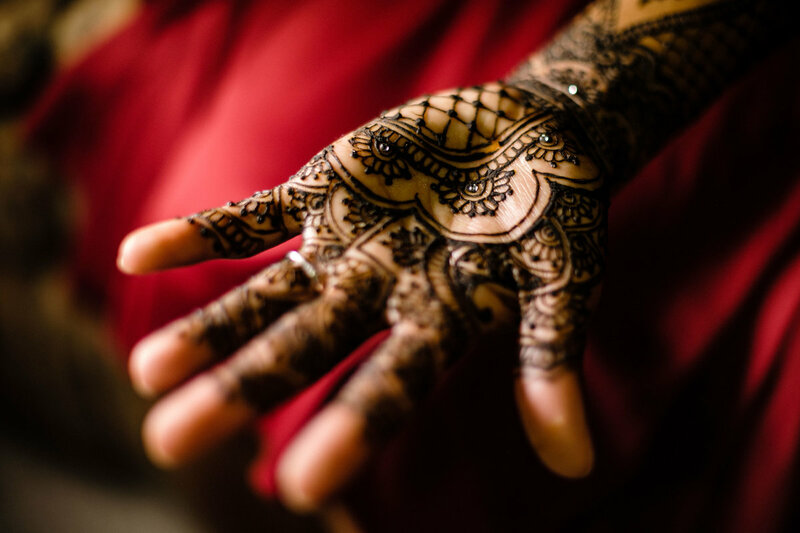 Only women are invited to this event, so it's a great opportunity to get photos of female attire, capture the interactions between the various members of the extended family and, of course, get photos of the mehndi or henna tattoos themselves. 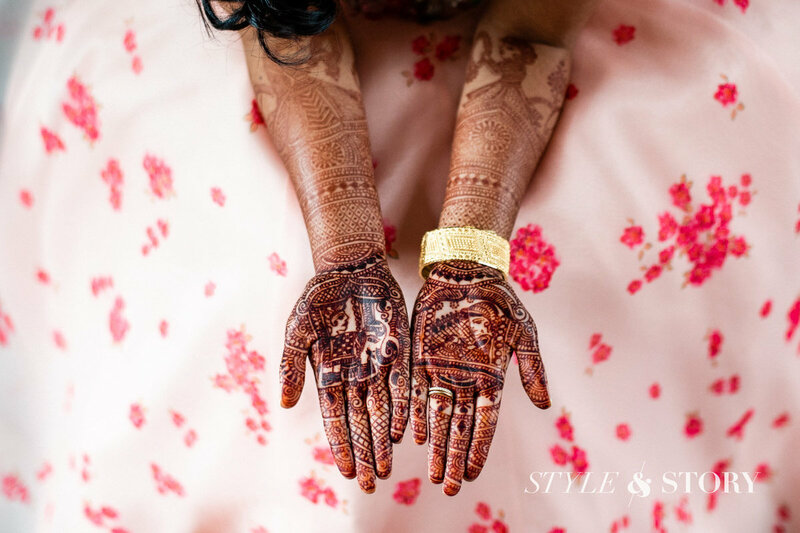 Given that these tattoos are gorgeous works of art, they deserve to be preserved for posterity. 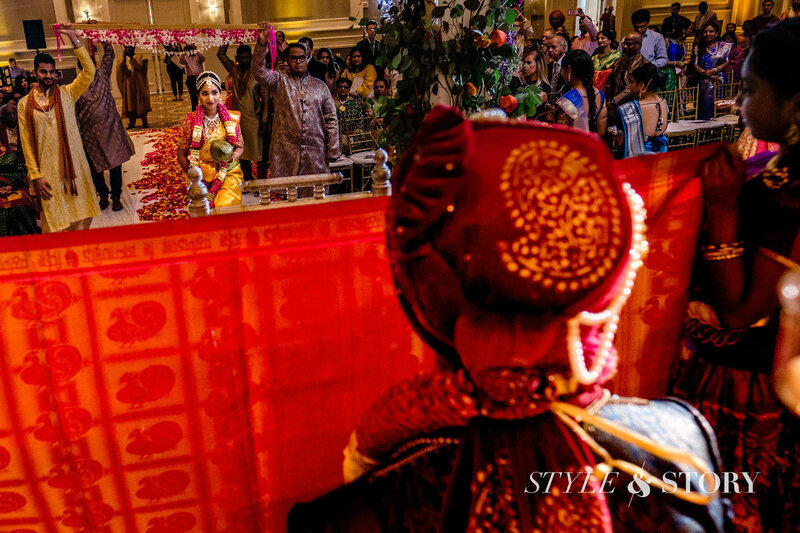 The procession to go pick up the bride or the baraat consists of the groom riding a horse, a turban on his head and his face covered with a curtain of jasmine flowers. Around him, everyone else is on foot, singing and dancing. 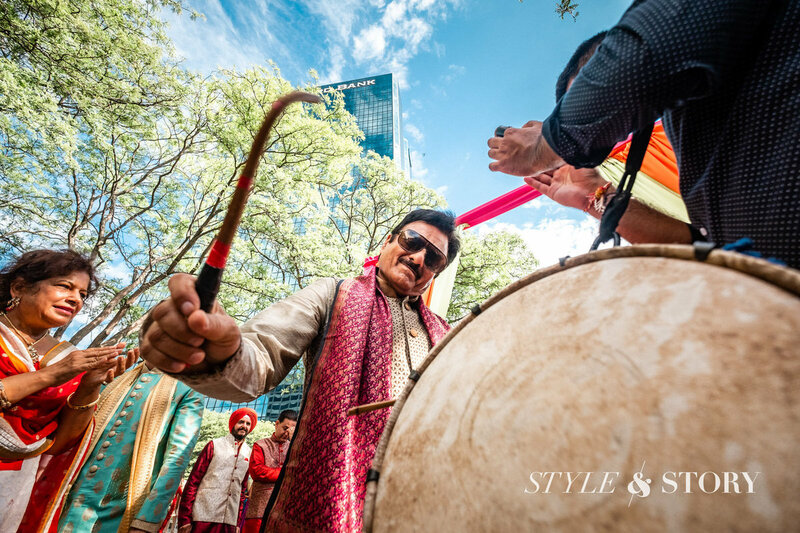 Often, a band accompanies the baraat, with a full set of drums and pipes, blaring out the melodies of the latest Bollywood songs. Some people have even been known to set off firecrackers in the street! 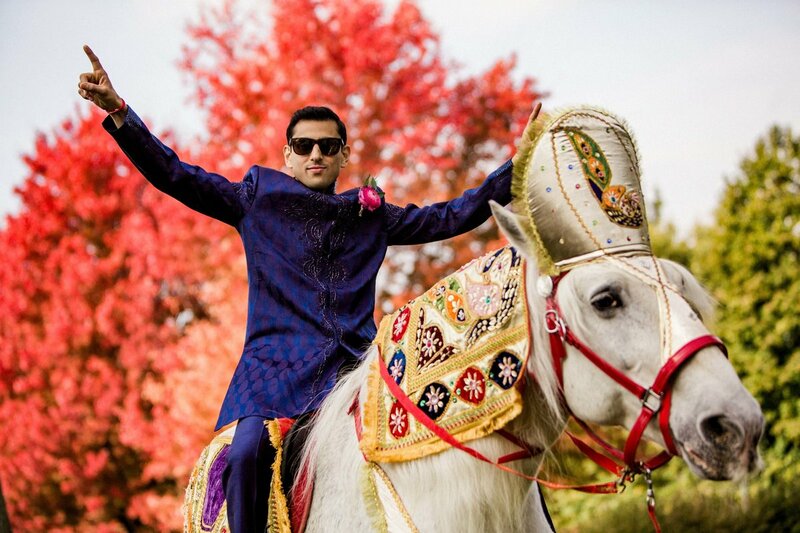 Nowadays, of course, it may not be possible to get a horse, set off fireworks or disrupt traffic to go pick up the bride. So the horse is sometimes replaced by a car and the procession shortened considerably. The singing and dancing do, however, continue. 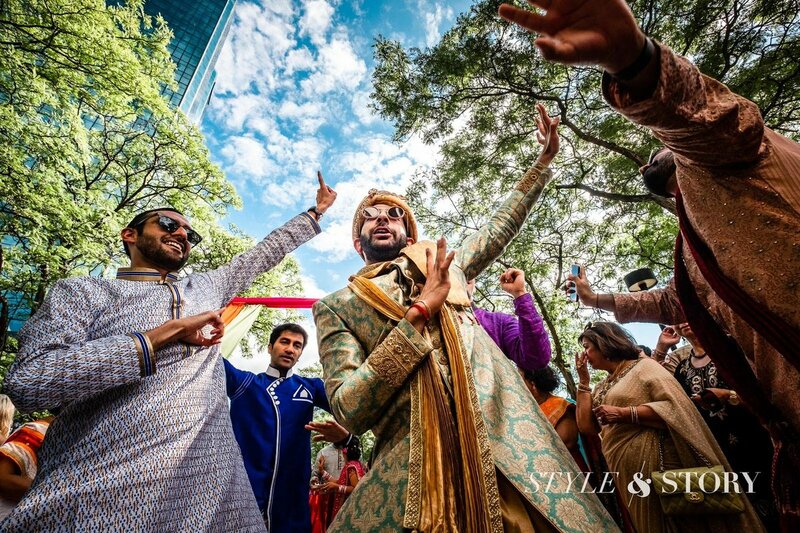 So it's a good opportunity for the wedding photographer to get photos of people dancing and enjoying themselves. 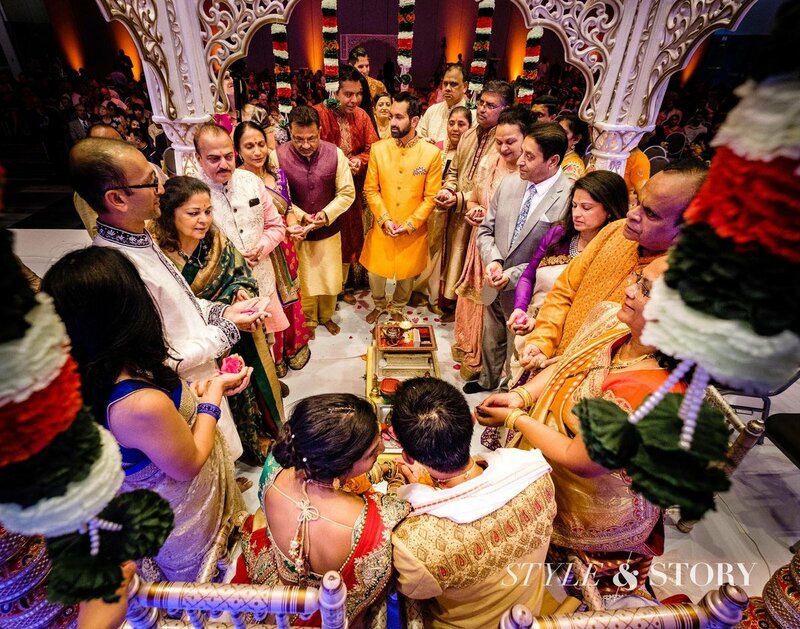 At the ceremony itself, things calm down a little because it's time to get down to business. 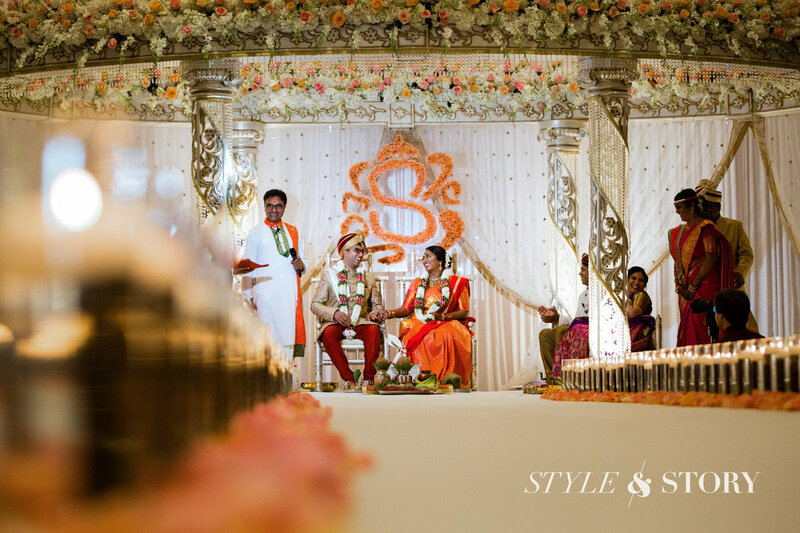 In general, a priest is in charge of the various aspects of the ceremony and guides the married couple about what to do next. 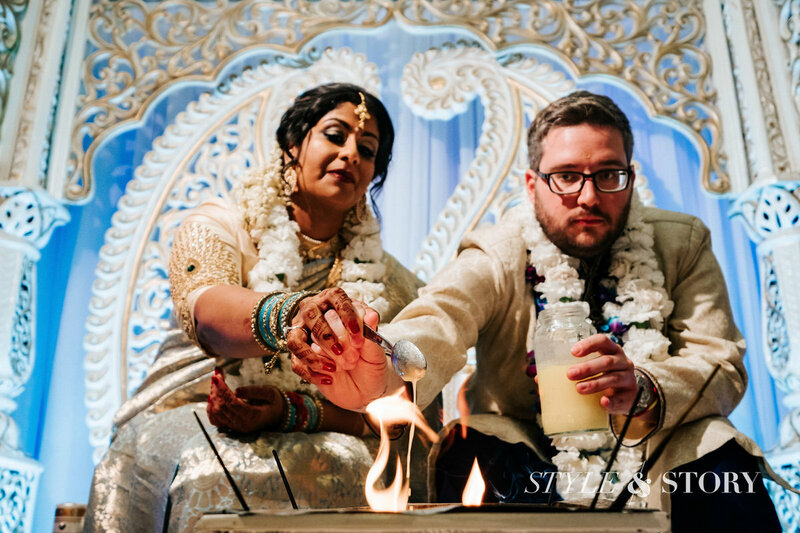 They may exchange rings, put ghee in the ceremonial fire, take seven rounds around the fire, exchange garlands etc. It depends on what part of India your family comes from. 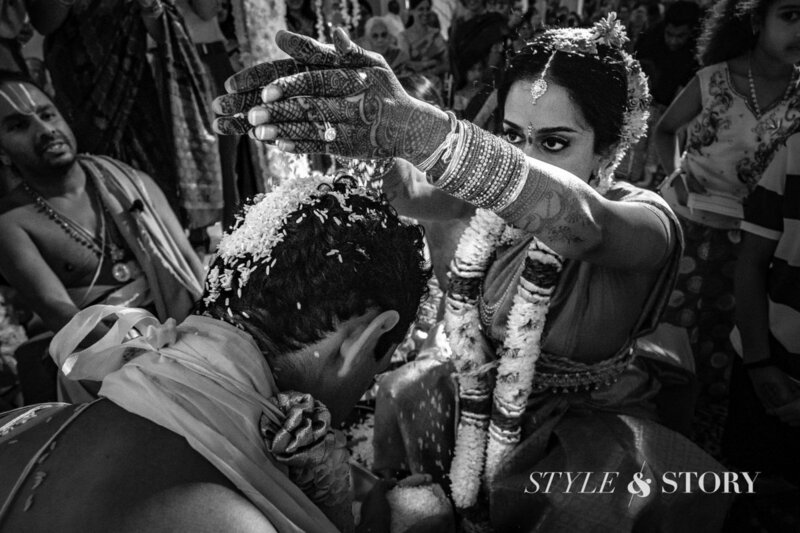 Still, photos of the ceremony can be intimate and evocative, focusing on the reactions of the bride and groom. 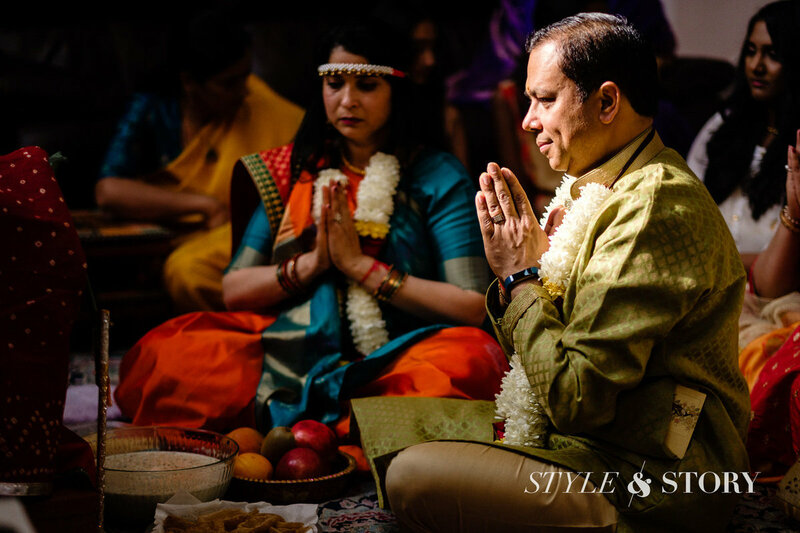 Rather than rushing through the ceremony, it's a good idea to focus on each and every ritual, absorb it and then move on. 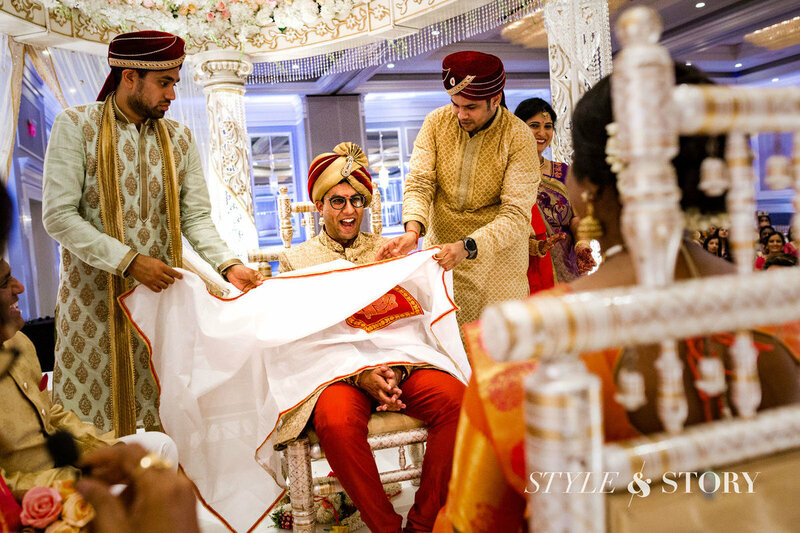 Not only will this give the wedding couple a chance to be in the moment, it also gives the wedding photographer a chance to capture their reactions as they're being bound together. 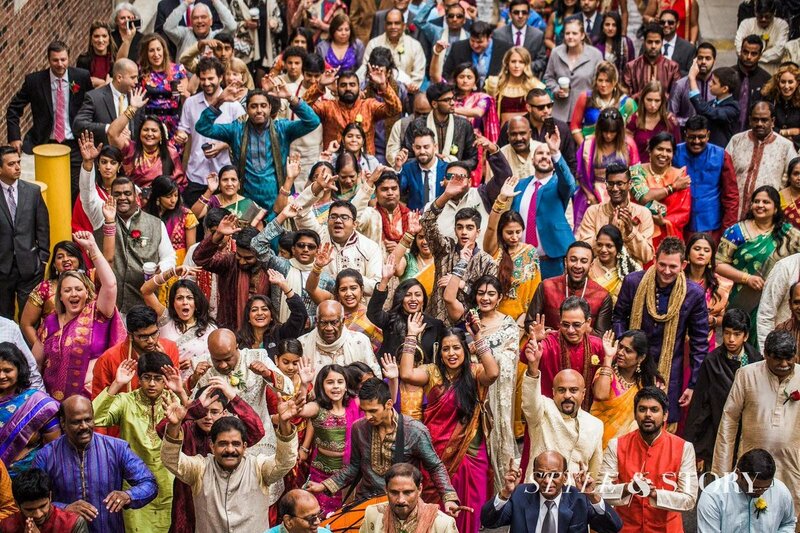 After the ceremony is over, everyone is more relaxed. 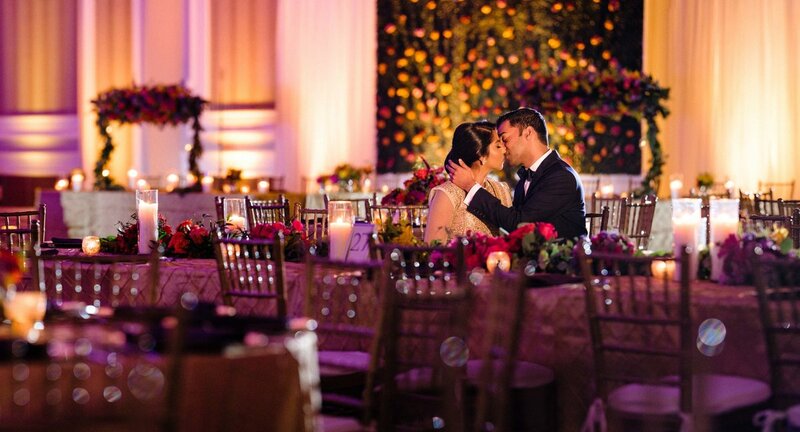 At the reception, you'll find people eating, talking and congratulating the bride and groom. Often, you'll have the bride and groom seated on a couple of throne-like chairs on a slightly raised dais. 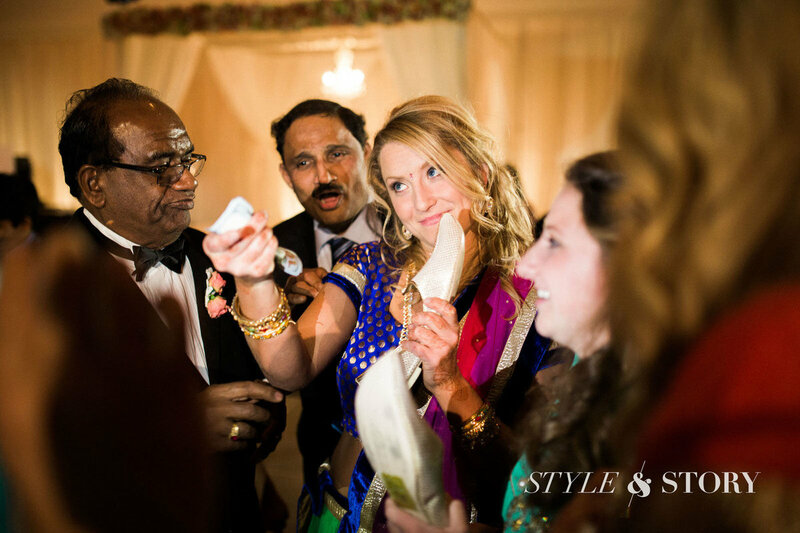 People go up to congratulate them and give them a wedding gift or an envelope with money. 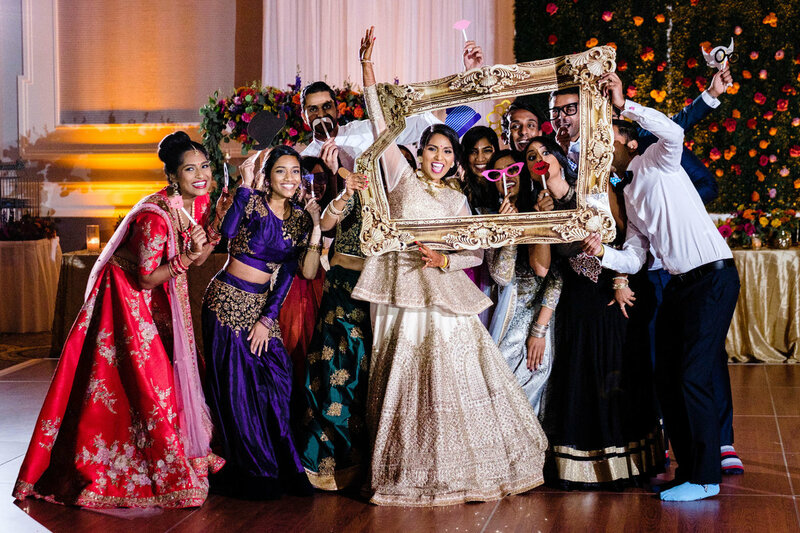 The reception is a good opportunity for the bride and groom to meet everyone and get photos with them. Additionally, the wedding photographer can capture the natural interaction of people at the reception. 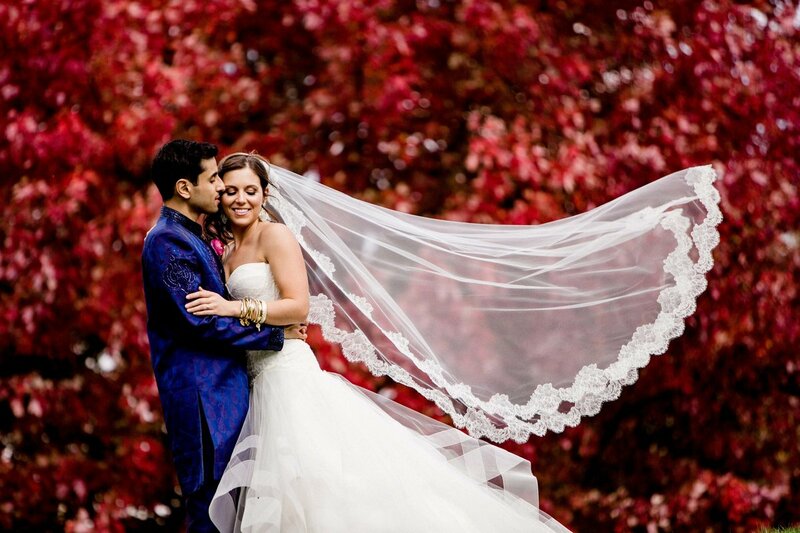 Given the festive nature of the occasion, it's possible to get good photos which people will treasure in the long run. A good wedding photographer can manage to be everywhere and yet be unobtrusive. 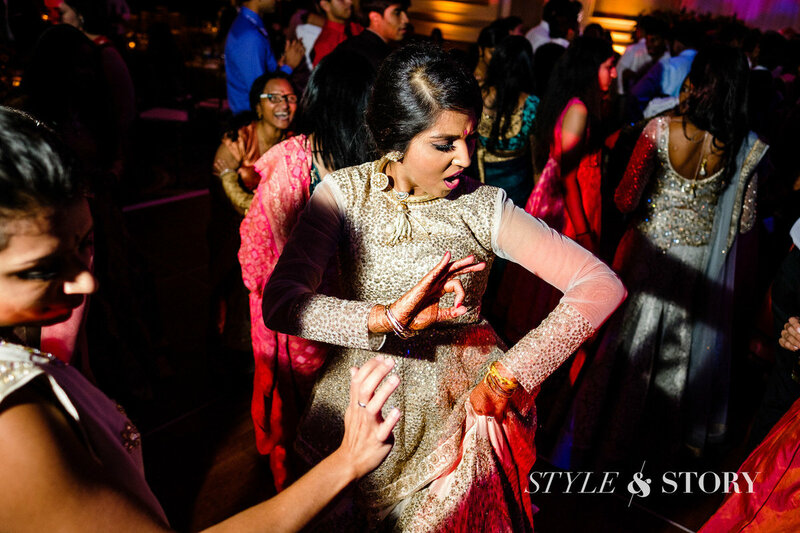 When all the formalities at the reception comes to an end, the most exuberant dance party ensues. 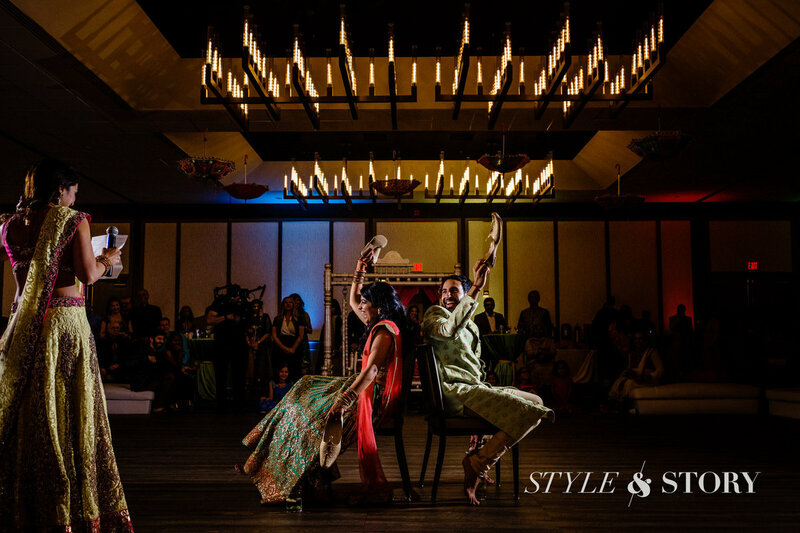 Your photographer will be there to capture the epic celebration, the dance battles, and the inevitable memories that will be formed. This is also the time when your DJ gets to shine. 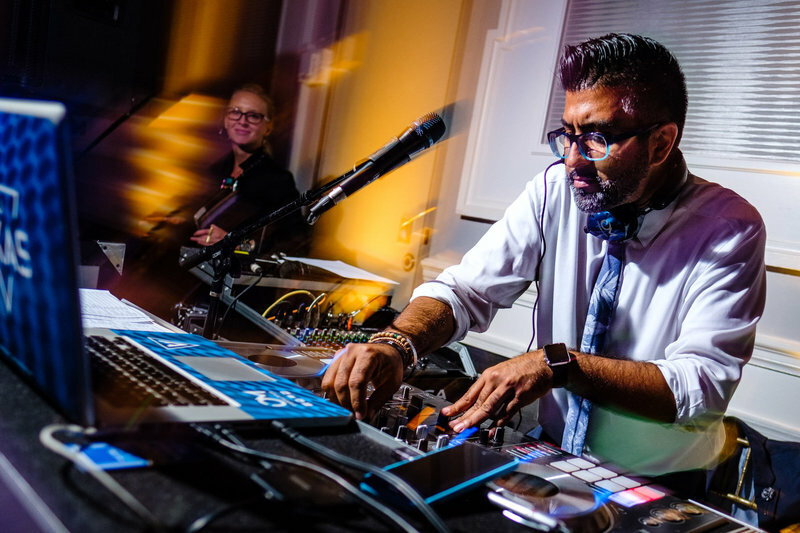 The right DJ will be able to read the room and mix the perfect tracks to keep your party going all night long. 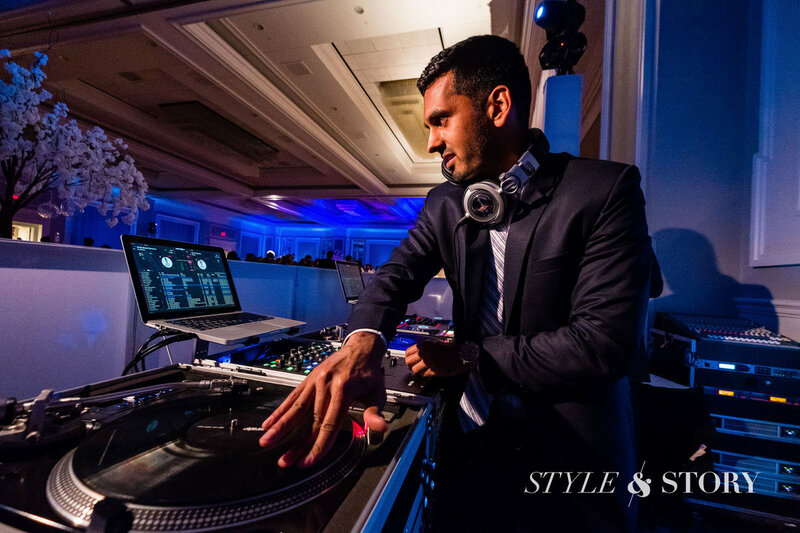 There's no one else we trust more than DJ Vikas Sondhi at Opening Minds Entertainment. 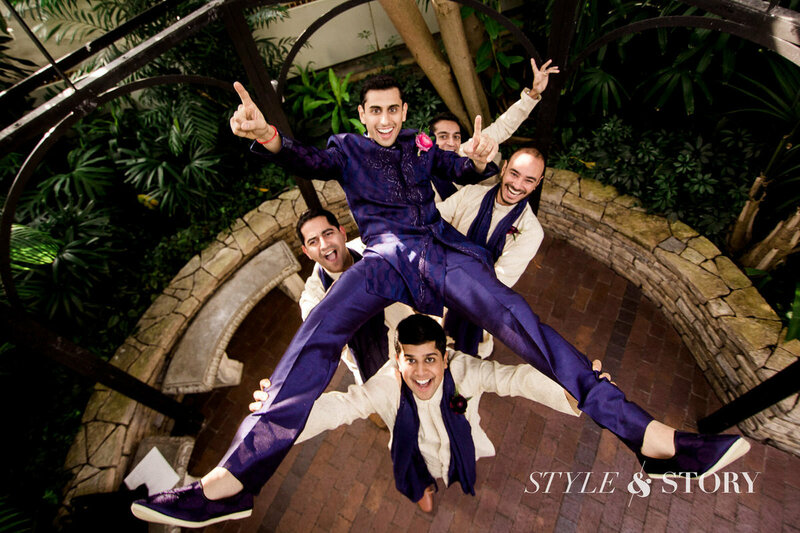 There's a lot of scope for creativity when it comes to Indian wedding photography. 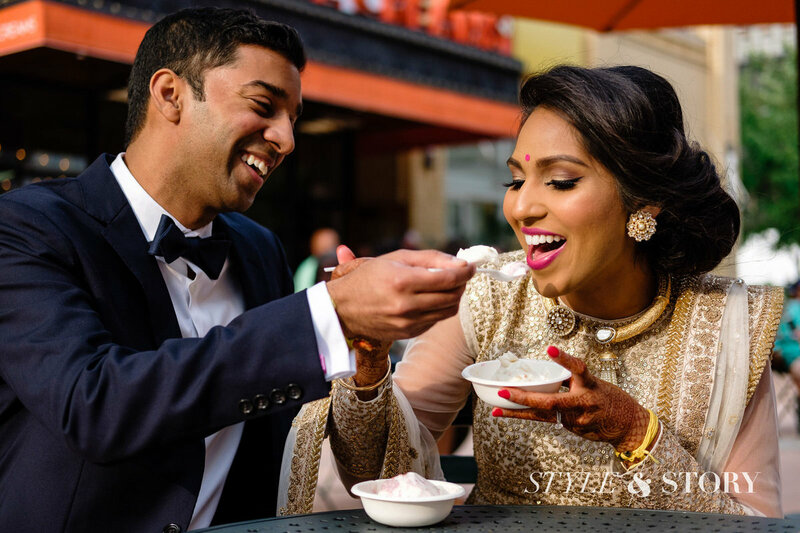 If you have a particular vision for your wedding photos and how you want them to look, feel free to talk to your photographer about it. 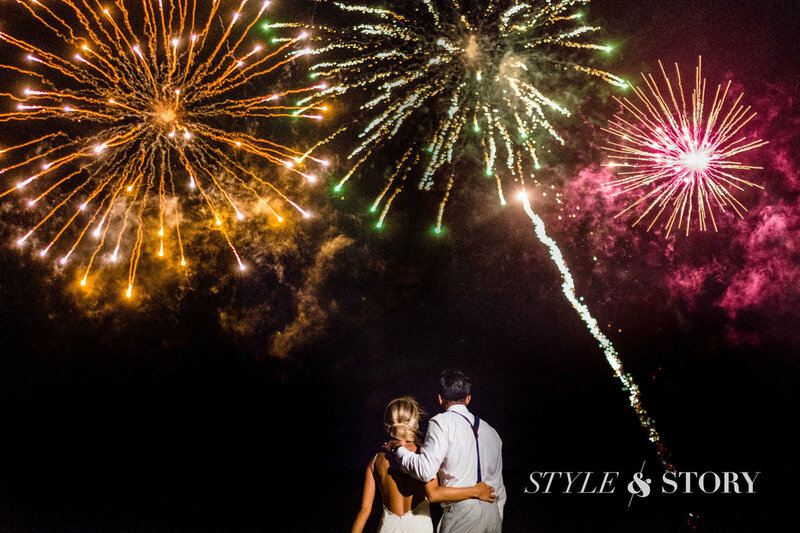 You can communicate freely with your wedding photographer about what you're looking for. How do you visualize these photos? Where do you want them to be taken? What angles would you like them to be taken from? Which events would you like to emphasize? Which outfits do you want to emphasize? 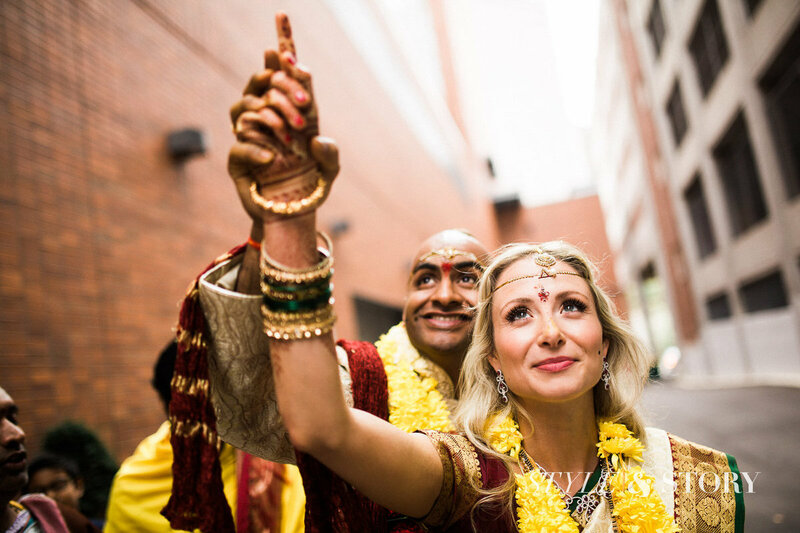 Do you feel more comfortable with photos that you have prepared for or naturalistic photos taken on the spur of the moment? 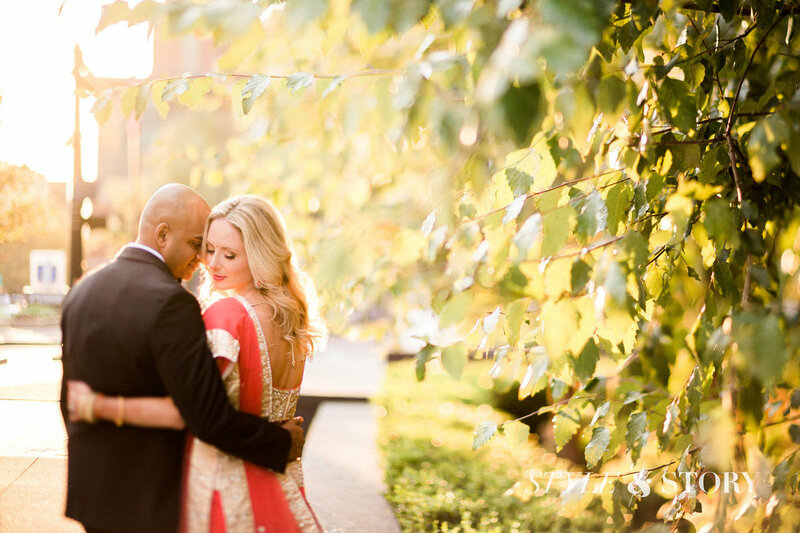 These are some important things to consider when it comes to wedding photography. 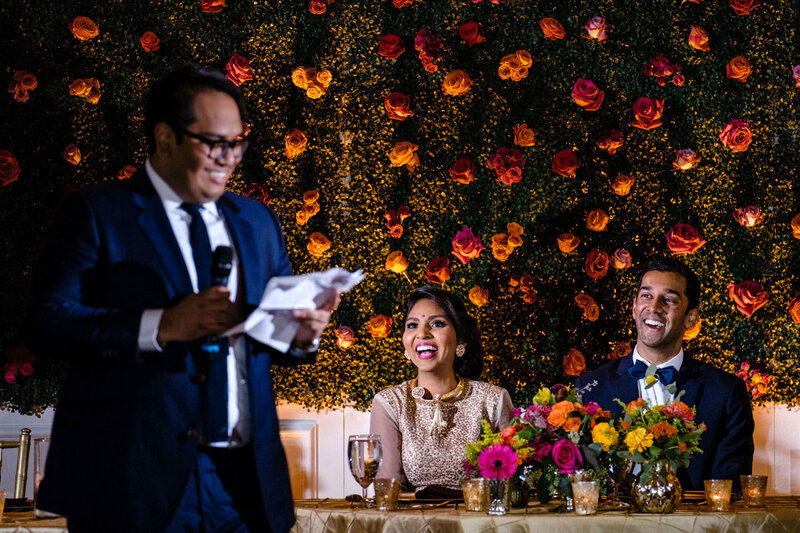 Think about these questions and try to come up with detailed answers which you can share with your wedding photographer. 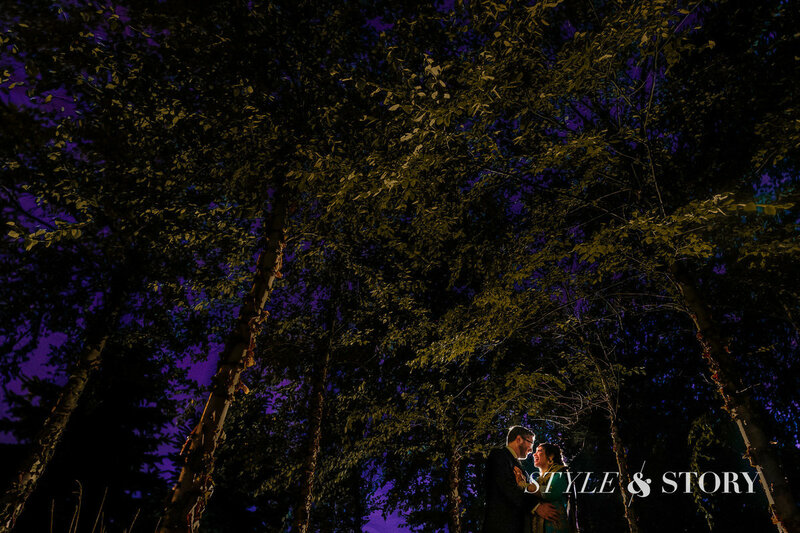 At the same time, don't forget to consult with the photographer too and get their input. 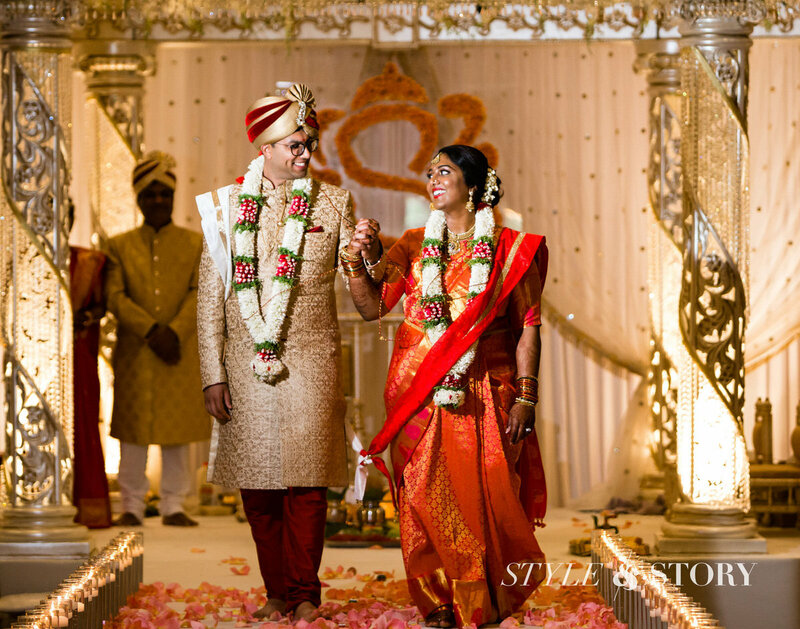 Your wedding photographer has been a chronicler of many weddings. They have a lot of experience. They know what couples getting married are looking for. And they have many creative ideas themselves. 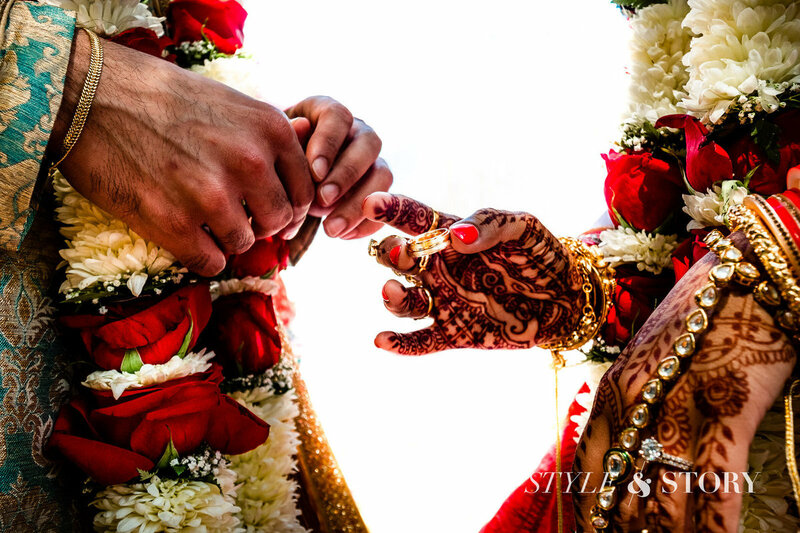 So working with your wedding photographer should be a creative collaboration and not just a one-way street. 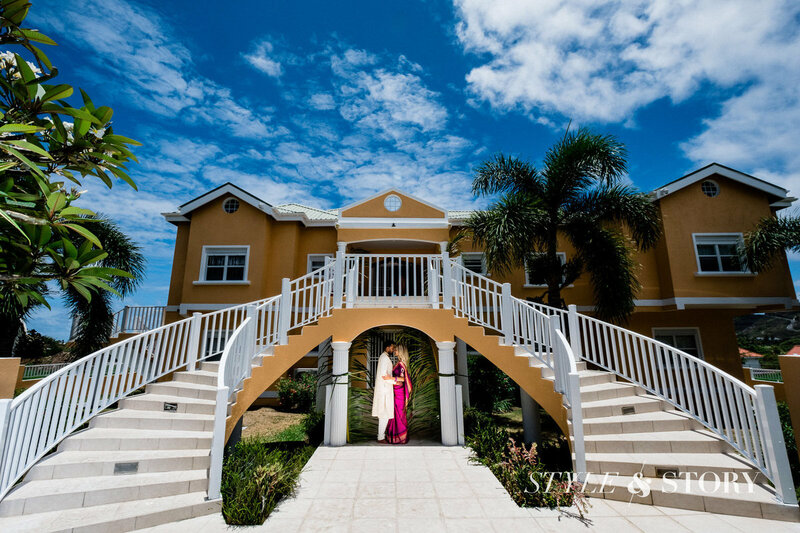 With a little bit of communication on both sides, your wedding photos will turn out to be as special as your wedding itself. 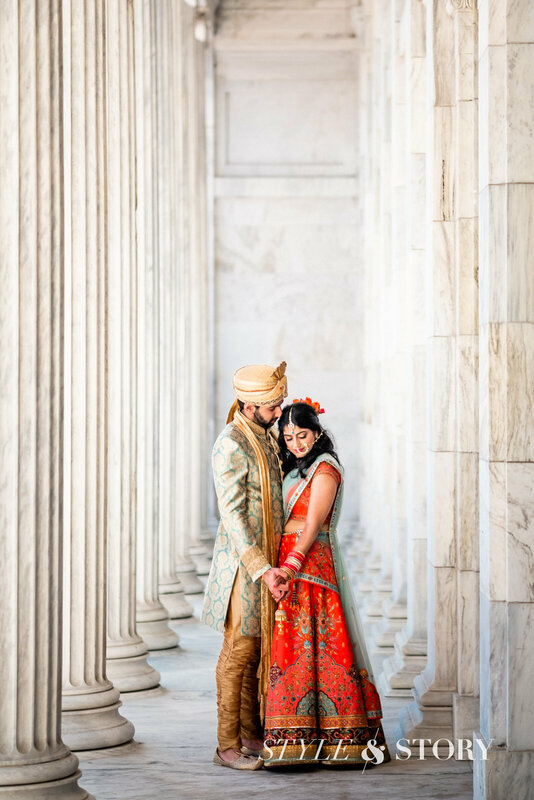 You might be wondering about the cost of hiring a wedding photographer for so many events and whether it's going to fit within your budget. 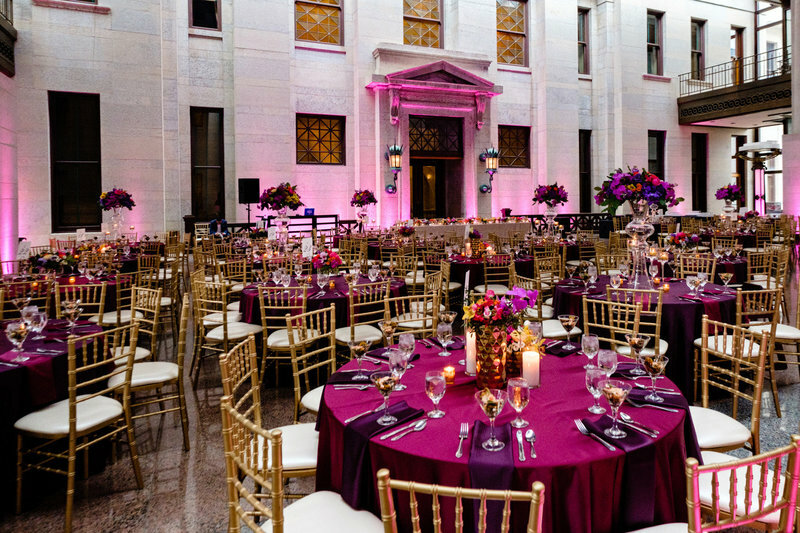 The good news is that you can get special pricing for multi-day events. 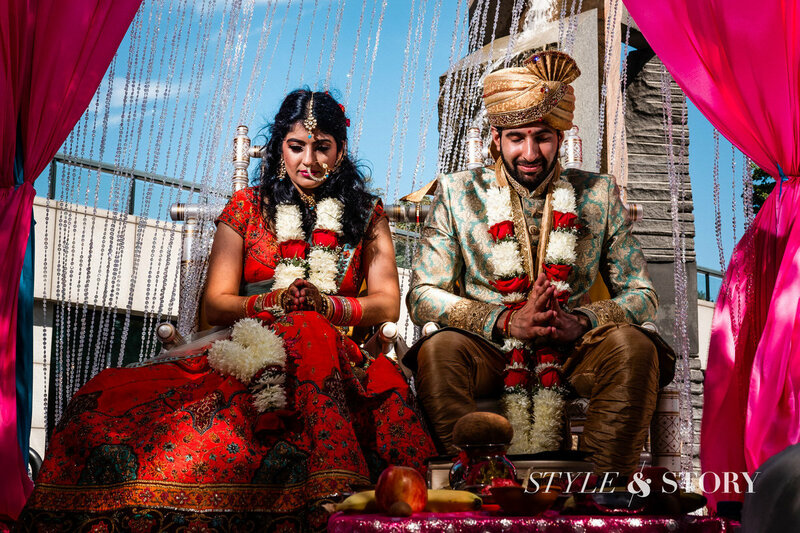 Speak to your photographer about how many events make up your wedding and how many of them you want to have professionally photographed. No matter what your needs, we can definitely come up with a package that works for you. 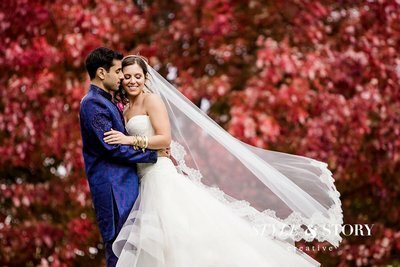 Because every Indian Wedding is going to have its own unique times, events, and needs - each Indian wedding photography price quote is custom to your needs. 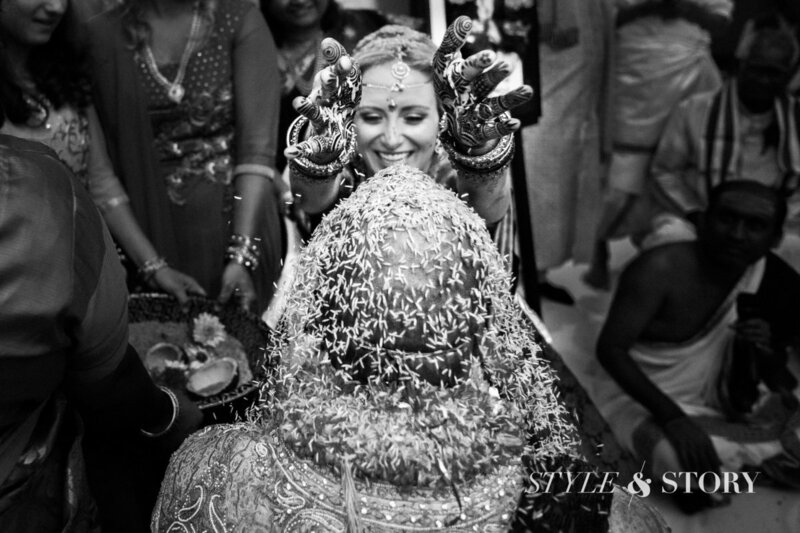 Contact us for detailed pricing & availability information for photographing your Indian wedding.